Disclosed are styryl sulfide dyes of formula (1), wherein R1, R'1, R2, R'2, R3 and R'3, independently from each other are hydrogen; C1-C20alkyl or C1-C20alkoxy, which may be substituted by one or more C1-C5alkoxy, halogen,-NH2, mono-C1-C5alkylamino, di-C1-C5alkylamino,-NO2 or hydroxy; C3-C6cycloalkyl;-C(O)H;-C(O)-C1-C5alkyl; halogen; NO2; OH; phenyl, which may be substituted by one or more C1-C5alkyl, C1-C5alkoxy, halogen,-NH2, mono-C1-C5alkylamino, di-C1-C5alkylamino,-NO2 or hydroxy; or a radical of formula-NR4R5, wherein R4 and R5 independently from each other are hydrogen; C1-C12alkyl, which may be substituted by one or more C1-C5alkyl, C1-C5-alkoxy, hydroxy or-(CO)-H;-(CO)-C1-C5alkyl; phenyl or phenyl-C1-C4alkyl, wherein the phenyl moiety may be substituted by one or more C1-C5alkyl, C1-C5alkoxy, halogen,-NH2, mono-C1-C5alkylamino, di-C1-C5alkylamino,-NO2, carboxy or hydroxy; W1, W'1, W2, W'2, W3, W'3, W4 or W'4, independently from each other are-CH-or-N+-; wherein only one of W1/W'1, W2/W'2, W3/W'3, W4/W4' is-N+; and the bivalent radical-Q-Z-Y-S-S-Y'-Z'-Q'-is bonded to W1 or W2 and W'1 or W'2 respectively; Y1 and Y2 independently from each other are C1-C10alkylene; C5-C10cycloalkylene; C5-C12arylene; or C5-C12arylene-(C1-C10alkylene) ; Q and Q' independently from each other are the direct bond; or-C(O)-;-C(O)O-;-OCO-;-N(R6)-; formula (AA);-C(O)N(R6)-;-(R6)NC(O)-;-O-;-S-;-S(O)-; or-S(O)2-; and R6 and R7 independently from each other are hydrogen; C1-C14alkyl; C2-C14alkenyl; C6-C12aryl; C6-C12aryl-C1-C10alkyl; or C1-C10alkyl(C5-C12aryl). Further, the present invention relates to novel styryl sulfide compounds, compositions thereof, especially comprising other dyes, and to processes for their preparation. 본 발명은 신규한 술피드 염료, 이들의 조성물, 이들의 제조방법 및 케라틴 섬유, 모, 가죽, 실크, 셀룰로오스 또는 폴리아미드, 특히 케라틴 함유 섬유, 목면 또는 나일론과 같은 유기 물질, 및 바람직하게는 모발, 더욱 바람직하게는 인간의 모발을 염색하기 위한 이들의 용도에 관한 것이다. The present invention relates to novel sulfide dyes, compositions thereof, methods for their preparation and keratin fibers, wool, leather, silk, cellulose or polyamides, especially keratin-containing organic materials such as fibers, cotton or nylon, and preferably hair, , and more preferably it relates to the use thereof for dyeing human hair. 예컨대 WO 95/01772호로부터는 양이온성 염료가 유기 물질, 예컨대 케라틴, 실크, 셀룰로오스 또는 셀룰로오스 유도체 및 또한 합성 섬유, 예컨대 폴리아미드를 염색하기 위해 사용될 수 있다고 알려져 있다. For example from WO 95/01772 it is known that the call can be used for dyeing a cationic dye organic material, for example keratin, silk, cellulose or cellulose derivatives, and also synthetic fibers, for example polyamide. 양이온성 염료는 매우 찬란한 색조를 나타낸다. Cationic dye shows a very brilliant shades. 그 단점은 세탁 견뢰도가 불만족스럽다는 점이다. Its disadvantage is that the wash fastness workable dissatisfaction. 알.에스. Unknown es. 애스퀴쓰, 피. Kwisseu astro, p. 카르튜 및 티.티. Carboxylic tunic and tea. Tea. 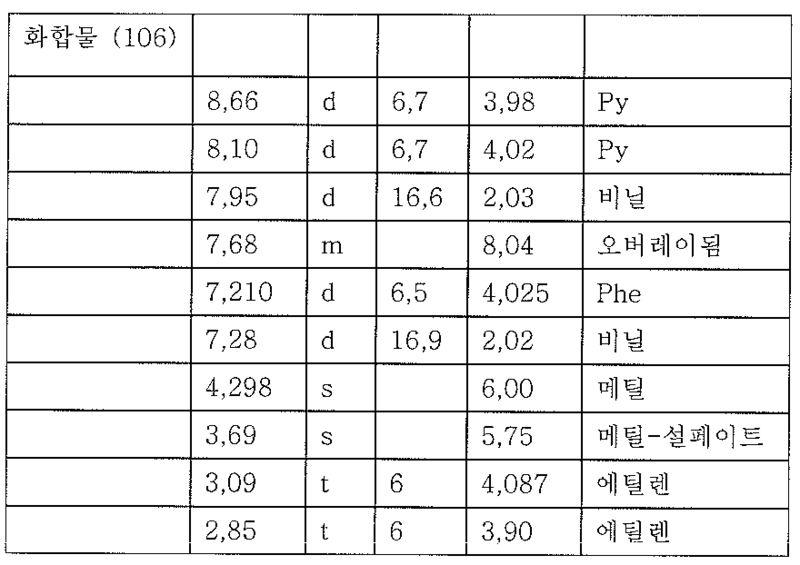 프랜시스(RS Asquity, P. Carthew and TT Francis)는 1973년 5월 JSDC, 168∼172 페이지에서 오르토-아조 디술피드 염료는 모의 케라틴 섬유와 공유 결합을 초래하지 않는 것과 파라-아조 디술피드 염료는 고온에서만 모(wool)와 일부 공유 결합을 형성한다고 개시하였다. 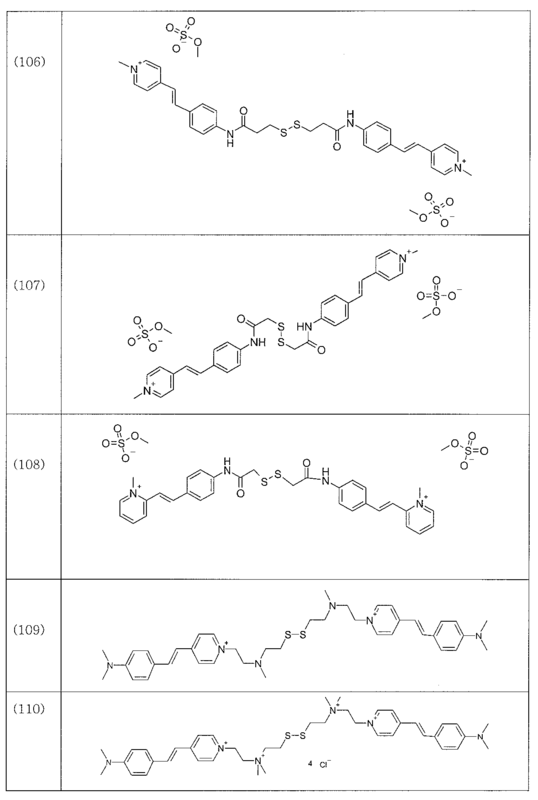 Francis (RS Asquity, P. Carthew and TT Francis) is May 1973 JSDC, at pages 168-172 ortho-as azo disulfide dyes do not lead to mock keratin fibers with covalent bonding para-azo disulfide dyes are hot only discloses that forms a base (wool) and some covalent bonds. 본 발명의 주요 기술적 과제는 세탁, 광, 샴푸 및 문지름에 대하여 양호한 견뢰도 특성을 갖는 깊이 염색되는 것을 특징으로 하는 염료를 제공하는 것이다. The main object of the present invention, there is provided a dye characterized in that the depth of dyeing having good fastness properties with respect to washing, light, rubbing and shampoo. R 6 및 R 6 and R 7 은 서로 독립적으로 수소; R 7 are each independently of the others hydrogen; C 1 -C 14 알킬; C 1 -C 14 alkyl; C 2 -C 14 알케닐; C 2 -C 14 alkenyl; C 6 -C 12 아릴; C 6 -C 12 aryl; C 6 -C 12 아릴-C 1 -C 10 알킬; C 6 -C 12 aryl -C 1 -C 10 alkyl; 또는 C 1 -C 10 알킬(C 5 -C 12 아릴)이다. Or a C 1 -C 10 alkyl (C 5 -C 12 aryl). 바람직하게는, Y 1 및 Y 2 는 비치환 또는 치환된 직쇄 또는 측쇄의 중간에 원소를 갖거나 갖지않는(interrupted 또는 uninterrupted) C 1 -C 10 알킬렌; Preferably, Y 1 and Y 2 are, with or without the element in the middle of an unsubstituted or substituted linear or branched (interrupted or uninterrupted) C 1 -C 10 alkylene; 또는 C 5 -C 10 시 클로알킬렌이고, 가장 바람직하게는 C 1 -C 5 알킬렌이다. Or C 5 -C alkylene claw 10 hours, and most preferably C 1 -C 5 alkylene. 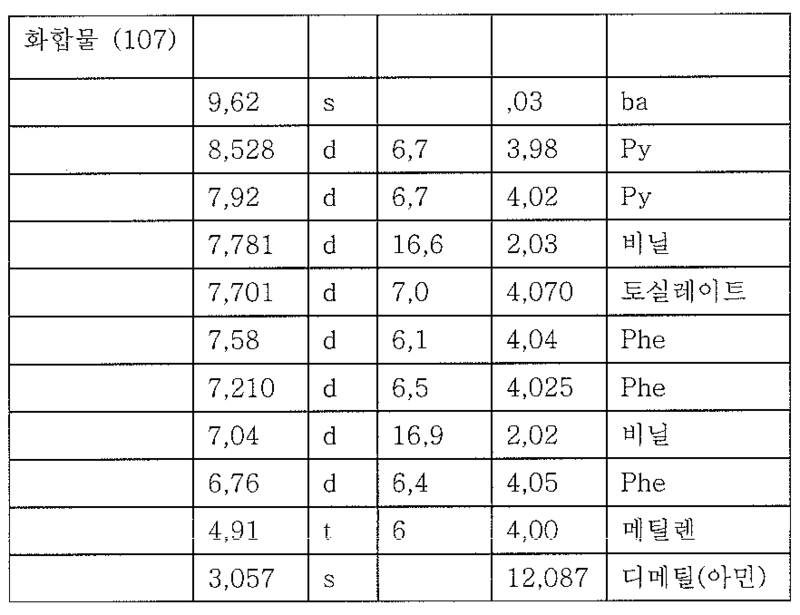 R 1 , R' 1 , R 2 , R' 2 , R 3 및 R' 3 는 서로 독립적으로 수소; R 1, R '1, R 2, R' 2, R 3 and R '3 are each independently of the others hydrogen; C 1 -C 5 알킬; C 1 -C 5 alkyl; NO 2 ; NO 2; 또는 화학식(1a) -NR 4 R 5 의 라디칼 (여기서 R 4 및 R 5 는 서로 독립적으로 수소임); Or the general formula (1a) the radical -NR 4 R 5 (wherein R 4 and R 5 are each hydrogen may independently); 또는 C 1 -C 5 알킬이다. Or a C 1 -C 5 alkyl. 가장 바람직하게는, R 1 , R' 1 , R 2 , R' 2 , R 3 및 R' 3 는 서로 독립적으로 수소; Most preferably, R 1, R '1, R 2, R' 2, R 3 and R '3 are each independently of the others hydrogen; C 1 -C 5 알킬; C 1 -C 5 alkyl; NO 2 ; NO 2; 또는 NH 2 이다. Or it is NH 2. 본 공정에서 가장 바람직한 것은, R 1 , R' 1 , R 2 , R' 2 , R 3 및 R' 3 가 수소인 화학식(1)의 화합물이다. Most preferred in the present process, R 1, R '1, R 2, R' 2, R 3 and R 'is a compound of formula (1) 3 is hydrogen. 바람직하게는, 본 발명의 공정에서 Q 및 Q'는 직접 결합 또는 -(R 6 )NC(O)-이고, 여기서 R 6 는 수소; Preferably, Q and Q 'in the process of the invention is a direct bond or - (R 6) NC (O ) - , wherein R 6 is hydrogen; 또는 C 1 -C 5 알킬이다. Or a C 1 -C 5 alkyl. R 1 , R' 1 , R 2 , R' 2 , R 3 , R' 3 , Q, Q', Y 및 Y'는 화학식(1)에서 정의한 바와 같다. R 1, R '1, R 2, R' 2, R 3, R '3, Q, Q', Y and Y 'are as defined in formula (1). Y 1 는 Y 2 와 동일하다. Y 1 is identical to Y 2. 알킬렌은 일반적으로 C 1 -C 12 알킬렌, 예컨대 메틸렌, 에틸렌, 프로필렌, 이소프로필렌, n-부틸렌, sec-부틸렌, tert-부틸렌, n-펜틸렌, 2-펜틸렌 3-펜틸렌, 2,2'-디메틸프로필렌, 시클로펜틸렌, 시클로헥실렌, n-헥실렌, n-옥틸렌, 1,1',3,3'-테트라메틸부틸렌, 2-에틸헥실렌, 노닐렌 또는 데실렌이다. Alkylene is typically C 1 -C 12 alkylene, such as methylene, ethylene, propylene, iso-propylene, n- butylene, sec- butylene, tert- butylene, n- pentylene, 2-pentylene 3-pen ethylene, 2,2'-dimethyl propylene, cyclopentylene, cyclohexylene, n- hexylene, n- octylene, 1,1 ', 3,3'-tetramethyl-butylene, 2-ethyl hexylene, no alkenylene or xylene is used. 알킬렌은 직쇄, 측쇄 또는 C 5 -알킬 이상의 일환식 또는 다환식일 수 있고 또 O, S, -CO-, N, NH, NR 54 , -OCO-, -CO(OR 4 )-, -CONR 4 -, -(R 5 )NC(O)-와 같은 헤테로 원자를 사슬 중간에 가질 수 있고; Alkylene is linear, branched or C 5 - may be an alkyl least part way or polycyclic addition O, S, -CO-, N, NH, NR 54, -OCO-, -CO (OR 4) -, -CONR 4 -, - (R 5) NC (O) - and may have a heteroatom, such as the intermediate chain; 예컨대 C 1 -C 10 알킬렌은 다음 잔기일 수 있다: -CH 2 CH 2 -O-CH 2 CH 2 -O-CH 2 CH 2 - , 또는 -CH 2 CH 2 -O-CH 2 CH 2 - , -CH 2 CH 2 -O-CH 2 -, -CH 2 -O-CH 2 -, -CH 2 CH 2 -CH 2 CH 2 -O-CH 2 -CH 2 -, -CH 2 CH 2 -CH(N(CH 3 ) 2 )-CH 2 -CH 2 -, CH 2 -NH 2 -CH 2 -CH 2 , 또는 For example C 1 -C 10 alkylene may be a glass of the following: -CH 2 CH 2 -O-CH 2 CH 2 -O-CH 2 CH 2 -, or -CH 2 CH 2 -O-CH 2 CH 2 - , -CH 2 CH 2 -O-CH 2 -, -CH 2 -O-CH 2 -, -CH 2 CH 2 -CH 2 CH 2 -O-CH 2 -CH 2 -, -CH 2 CH 2 -CH (N (CH 3) 2) -CH 2 -CH 2 -, CH 2 -NH 2 -CH 2 -CH 2, or -CH 2 CH 2 -NH-CH 2 CH 2 -, -CH 2 CH 2 -NCH 3 -CH 2 CH 2 -, 또는 -CO-CH 2 -, 또는 -CH 2 CO-, 또는 -CH 2 CH 2 -NHCO-CH 2 CH 2 -, 또는 -CH 2 CH 2 -CONH-CH 3 -CH 2 CH 2 -, -CH 2 CH 2 -NCH 3 CO-CH 2 CH 2 -, 또는 -CH 2 CH 2 -CONCH 3 -CH 3 -CH 2 CH 2 -, 또는 -CH 2 -NHCO-CH 2 CH 2 -, 또는 -CH 2 CH 2 -NHCO-CH 2 -, 또는 -CH 2 CH 2 -CONH-CH 2 - 또는 -CH 2 -CONH-CH 2 CH 2 -. -CH 2 CH 2 -NH-CH 2 CH 2 -, -CH 2 CH 2 -NCH 3 -CH 2 CH 2 -, or -CO-CH 2 -, or -CH 2 CO-, or -CH 2 CH 2 -NHCO-CH 2 CH 2 -, or -CH 2 CH 2 -CONH-CH 3 -CH 2 CH 2 -, -CH 2 CH 2 -NCH 3 CO-CH 2 CH 2 -, or -CH 2 CH 2 - CONCH 3 -CH 3 -CH 2 CH 2 -, or -CH 2 -NHCO-CH 2 CH 2 -, or -CH 2 CH 2 -NHCO-CH 2 -, or -CH 2 CH 2 -CONH-CH 2 - or -CH 2 -CONH-CH 2 CH 2 -. 아릴렌은 일반적으로 C 6 -C 12 아릴렌이며; Arylene is typically C 6 -C 12 arylene, and; 예컨대 페닐 또는 나프틸이다. It is for example phenyl or naphthyl. 아릴알킬렌은 예컨대 C 5 -C 12 아릴-C 1 -C 10 알킬렌, C 6 -C 12 아릴-C 1 -C 2 알킬렌이고, 알킬아릴렌은 예컨대 C 1 -C 10 알킬-C 5 -C 12 아릴렌 또는 C 1 -C 2 알킬-C 6 -C 12 아릴렌이다. Arylalkylene, for example C 5 -C 12 aryl -C 1 -C 10 alkylene, C 6 -C 12 aryl -C 1 -C 2 alkylene, alkyl, arylene is for example C 1 -C 10 alkyl, -C 5 -C 12 arylene or C 1 -C 2 alkyl is -C 6 -C 12 arylene. C 5 -C 10 시클로알킬렌은 예컨대 시클로펜틸렌, 시클로헥실렌, 모르폴릴렌 또는 피페리디닐렌이다. C 5 -C 10 cycloalkylene is for example cyclopentylene, cyclohexylene, tolylene know pole or piperidinyl alkenylene. C 1 -C 16 알킬은 예컨대, 메틸, 에틸, 프로필, 이소프로필, n-부틸, sec-부틸, tert-부틸, n-펜틸, 2-펜틸, 3-펜틸, 2,2'-디메틸프로필, 시클로펜틸, 시클로헥실, n-헥실, n-옥틸, 1,1',3,3'-테트라메틸부틸 또는 2-에틸헥실, 노닐, 데실, 운데실, 도데실, 트리데실, 테트라데실, 펜타데실 또는 헥사데실이다. C 1 -C 16 alkyl is for example, methyl, ethyl, propyl, isopropyl, n- butyl, sec- butyl, tert- butyl, n- pentyl, 2-pentyl, 3-pentyl, 2,2-dimethylpropyl, cyclopentyl, cyclohexyl, n- hexyl, n- octyl, 1,1 ', 3,3'-tetramethylbutyl or 2-ethylhexyl, nonyl, decyl, undecyl, dodecyl, tridecyl, tetradecyl, pentadecyl a decyl or hexadecyl. C 1 -C 6 알콕시는 바람직하게는 메톡시, 에톡시, 프로폭시, 부톡시, 페틸옥시 또는 헥실옥시이다. C 1 -C 6 alkoxy is preferably methoxy, ethoxy, propoxy, butoxy, or hexyloxy is petil oxy. C 5 -C 12 아릴-C 1 -C 10 알킬렌은 예컨대 페닐-C 1 -C 10 알킬렌 또는 나프틸-C 1 -C 10 알킬렌이다. C 5 -C 12 aryl -C 1 -C 10 alkylene is, for example, phenyl -C 1 -C 10 alkylene or naphthyl -C 1 -C 10 alkylene. C 6 -C 12 아릴-C 1 -C 2 알킬렌 및 C 1 -C 2 알킬-C 6 -C 12 아릴렌은 예컨대 페닐-C 1 -C 10 알킬렌 또는 나프틸-C 1 -C 10 알킬렌이다. C 6 -C 12 aryl -C 1 -C 2 alkylene, and C 1 -C 2 alkyl, -C 6 -C 12 arylene, for example phenyl -C 1 -C 10 alkylene or naphthyl -C 1 -C 10 alkyl It is alkylene. 할라이드는 예컨대 플루오라이드, 클로라이드, 브로마이드 또는 요오다이드, 특히 클로라이드 및 플루오라이드이다. Halide is, for example, fluoride, chloride, bromide or iodide, especially chloride and fluoride. "음이온"은 예컨대 유기 또는 무기 음이온이며, 이를테면 할라이드, 바람직하게는 클로라이드 및 플루오라이드, 술페이트, 수소 술페이트, 포스페이트, 사불화붕소, 카보네이트, 비카보네이트, 옥살레이트 또는 C 1 -C 8 알킬 술페이트, 특히 메틸 술페이트 또는 에틸 술페이트이며; "Anion" is for example an organic or inorganic anion, such as halide, preferably chloride and fluoride, sulfate, hydrogen sulfate, phosphate, boron tetrafluoride, carbonate, bicarbonate, oxalate or C 1 -C 8 alkyl alcohol sulfate, especially methyl sulfate or ethyl sulfate, and; 음이온은 또한 락테이트, 포르메이트, 아세테이트, 프로피오네이트 또는 염화아연 이중 염과 같은 착물 음이온이다. Anions are also complex anions such as lactate, formate, acetate, propionate, or zinc chloride double salt. 음이온은 특히 할라이드, 바람직하게는 클로라이드 또는 플루오라이드, 술페 이트, 수소 술페이트, 메틸 술페이트, 에틸 술페이트, 포스페이트, 포르메이트, 아세테이트 또는 락테이트이다. The anion is especially a halide, preferably chloride or fluoride, sulpe byte, hydrogen sulfate, methyl sulfate, ethyl sulfate, phosphate, formate, acetate or lactate. 음이온은 보다 특히 플루오라이드, 클로라이드, 메틸 술페이트, 에틸 술페이트, 포르메이트 또는 아세테이트이다. The anion is especially fluoride, chloride, methyl sulfate, ethyl sulfate, formate or acetate more. 본 발명의 또 다른 실시양태는 화학식(1)의 염료를 제조하는 방법에 관한 것이다. Another embodiment of the invention relates to a process for preparing a dye of the formula (I). 제3 반응 단계는 용매, 예를 들면 물, 알코올, 이를테면 메탄올, 에탄올, 2-프로판올 또는 부탄올; The third reaction step in a solvent, such as, for example, water, alcohols, such as methanol, ethanol, 2-propanol or butanol; 니트릴, 이를테면 아세토니트릴 또는 프로피오니트릴; Nitriles, such as acetonitrile or propionitrile; 아미드, 이를체면 디메틸포름아미드, 디메틸아세트아미드, N-메틸피롤리돈; Amide, which face dimethylformamide, dimethylacetamide, N- methylpyrrolidone; 염소화 탄화수소, 이를테면 클로로포름, 클로로벤젠 또는 트리클로로에틸렌; Chlorinated hydrocarbons, such as ethylene with chloroform, trichloroethane or chlorobenzene; 또는 기타 용매, 이를테면 디메틸술폭시드 중에서 실시될 수 있다. Or other solvents, such as can be conducted in dimethyl sulfoxide. 통상적으로, 온도는 출발 화합물을 혼합하는 동안 273∼293K 범위이고, 바람직하게는 300∼370K 범위이다. Typically, the temperature is in the range 273~293K, preferably 300~370K range during the mixing of the starting compounds. 상기 반응 시간은 일반적으로 출발 화합물의 반응성, 선택한 반응 온도 및 소망하는 전환율에 따라 달라진다. The reaction time is generally dependent on the reactivity, the reaction temperature chosen and on the desired conversion rate of the starting compound. 선택한 반응 시간은 통상 1시간∼3일 범위이다. The reaction time is selected usually from the range 1-3 hours. 선택한 반응 압력은 0.1∼10 바아, 특히 0.2∼3.0 바아, 더욱 특히 대기압이다. The selected reaction pressure is 0.1 to 10 bar, in particular 0.2 to 3.0 bar, more in particular atmospheric pressure. 촉매 존재하에서 화합물의 반응을 실시하는 것이 바람직할 것이다. It would be desirable to conduct the reaction of the compound in the presence of a catalyst. 적합한 촉매는 예컨대 알칼리 금속 C 1 -C 6 알킬옥시드, 예컨대 나트륨-, 칼륨 또는 리튬 C 1 -C 6 알킬옥시드, 바람직하게는 나트륨 메톡사이드, 칼륨 메톡사이드 또는 리튬 메톡사이드, 또는 나트륨 에톡사이드, 칼륨 에톡사이드 또는 리튬 에톡사이드; Suitable catalysts are for example an alkali metal C 1 -C 6 alkyl-oxide, for example, sodium-, potassium or lithium C 1 -C 6 alkylene oxide, preferably sodium methoxide, potassium methoxide or lithium methoxide, or sodium ethoxide , potassium ethoxide or lithium ethoxide; sec- 또는 tert-아민, 예컨대 치누클리딘, N-메틸피페리딘, 피리딘, 트리메틸아민, 디메틸아민, 디에틸아민, 트리에틸아민, 트리옥틸아민, 1,4-디아자비시클로[2.2.2]옥탄, 치누클리딘, N-메틸피페리딘; sec- or tert- amine, such as Porgy Cleveland Dean, N- methylpiperidine, pyridine, trimethylamine, dimethylamine, diethylamine, triethylamine, trioctylamine, 1, 4-diazabicyclo [2.2. ] octane, Porgy Cleveland Dean, N- methyl piperidine; 또는 알칼리 금속 아세테이트, 예컨대 아세트산 나트륨, 아세트산 칼륨 또는 아세트산 리튬이다. Or an alkali metal acetate such as sodium acetate, potassium acetate, or lithium acetate. 아세트산 칼륨, 나트륨 메톡사이드, 피리딘 및 1,4-디아자비시클로[2.2.2]-옥탄, 피페리딘이 바람직하다. Potassium acetate, sodium methoxide, pyridine and 1,4-diazabicyclo [2.2.2] octane, blood is piperidine being preferred. 화학식(1a)의 화합물 대 촉매의 몰비는 일반적으로 10:1 내지 1:5 범위, 특히 10:1 내지 1:1 범위이다. The molar ratio of compound to catalyst of formula (1a) is generally from 10: 1 to 1: 5 range, in particular from 10: 1 to 1: 1 range. 본 발명의 방법에 따라 제조된 생성물은 가공되어 분리되고 필요한 경우 정제될 수 있다. Prepared according to the method of the invention the product can be purified and isolated, if the machining required. 통상적으로, 가공은 반응 혼합물의 온도를 280∼350K 범위, 특히 290∼320K 범위로 감소시킴으로써 개시된다. Typically, the process is initiated by reducing the temperature of the reaction mixture at 280~350K range, especially 290~320K range. 온도는 수 시간에 걸쳐 서서히 감소시키는 것이 바람직하다. Temperature is preferably set to gradually decrease over a period of several hours. 일반적으로 반응 생성물은 여과해 낸 다음, 물, 용매 또는 염 용액에 의해 세척된 다음 건조된다. In general, the reaction product is filtered to system out, washed by water, solvent or a salt solution is then dried. 여과는 바람직하게는 진공에서, 표준 여과 장치에 의해, 예컨대 뷔크너 깔때기, 여과 압축기, 압축 흡입 여과기에서 통상 실시된다. Filtration is preferably in a vacuum, it is carried out usually in, for example, Baden keuneo funnel, filtered compressor, compressing the suction filter by standard filtration equipment. 건조 온도는 적용 압력에 따라 다르다. The drying temperature is dependent on the applied pressure. 건조는 통상 50∼200 mbar의 진공에서 실시된다. Drying is carried out in the normal 50~200 mbar vacuum. 건조는 313∼363K 범위의 온도, 특히 323∼353K 범위, 더욱 특히 328∼348K 범위의 온도에서 실시된다. Drying is carried out at a temperature in the range 313~363K, especially 323~353K range, more particularly in a temperature range of 328~348K. 생성물은 분리 후 재결정에 의해 정제되는 것이 유리하다. The product is advantageously purified by re-crystallization after separation. 유기 용매 및 용매 혼합물, 바람직하게는 알코올, 예컨대 메탄올, 에탄올, 2-프로판올 또는 부탄올, 특히 2-프로판올은 재결정화용으로 적합하다. Organic solvents and solvent mixtures, preferably alcohols, such as methanol, ethanol, 2-propanol or butanol, especially 2-propanol are suitable as recrystallized for purification. 본 발명에 따른 화학식(1)의 염료는 유기물질, 예컨대 케라틴 함유 섬유, 모, 가죽, 실크, 셀룰로오스 또는 폴리아미드, 목면 또는 나일론 및 바람직하게는 인간 모발을 염색하기에 적합하다. Dyes of the formula (I) according to the invention is suitable for organic materials, such as keratin-containing fibers, wool, leather, silk, cellulose or polyamides, cotton or nylon, and preferably human hair, the dyeing. 얻어진 염색물은 색조 깊이 및 이들의 세탁 견뢰도, 예컨대 광, 샴푸 및 문지름에 대한 견뢰도가 우수하다. The obtained dye is excellent in color tone and depth thereof wash fastness, for example fastness to light and shampoo and rubbing. 본 발명에 따른 염료의 안정성이 특히 탁월하다. The stability of the dyes according to the present invention is particularly excellent. - 영구적 염색제. - permanent dye. 염료의 색조의 다양성은 다른 염료와의 조합에 의해 증가될 수 있다. Variety of shades of the dyes can be increased by combination with other dyes. 따라서 본 발명의 화학식(1)의 염료는 동일하거나 상이한 종류의 염료, 특히 직접 염료, 산화 염료, 커플러 화합물의 염료 전구체 조합물 뿐만 아니라 디아조화된 화합물 또는 캡핑된 디아조화된 화합물; Therefore the dyes of formula (1) of the present invention are the same or different kinds of dyes, in particular a direct dye, a dye precursor, as well as a combination of oxidation dyes, couplers or compound dia harmonized compound capped diazotized compound; 및/또는 양이온성 반응성 염료와 조합될 수 있다. And / or it may be combined with cationic dyes. 직접 염료는 천연 기원일 수 있거나 합성 제조될 수 있다. Direct dyes may be synthesized may be a natural origin. 이들은 비충전(uncharged), 양이온성 또는 음이온성, 예컨대 산 염료일 수 있다. These can be unfilled (uncharged), cationic or anionic, such as acid dyes. 화학식(1)의 염료는 화학식(1)의 염료와는 상이한 1 이상의 단일 직접 염료와 조합되어 사용될 수 있다. Dye of formula (1) may be used in combination with at least one single direct dye different from the dyes of the formula (1). 직접 염료는 이들의 염색 효과를 발현하기 위하여 산화제의 부가를 필요로 하지 않는다. Direct dyes do not require any addition of an oxidizing agent in order to express their dyeing effect. 따라서 염색 결과는 영구적 염색 조성물에 의해 얻은 것에 비하여 영구성이 덜하다. Thus the dyeing results are less permanent than that obtained by the permanent dyeing compositions. 따라서 직접 염료는 반영구적 모발 염색을 위해 사용된다. Therefore, direct dyes are used for semi-permanent hair dye. 직접 염료의 예는 "Dermatology", Ch. Examples of direct dyes "Dermatology", Ch. Culnan, H. Maibach 편찬, Verlag Marcel Dekker Inc., New York, Basle, 1986, Vol. Culnan, H. Maibach compilation, Verlag Marcel Dekker Inc., New York, Basle, 1986, Vol. 7, Ch. 7, Ch. Zviak, The Science of Hair Care, chapter 7, pages 248-250 및 The European Commission에 의해 발표되고 the Bundesverband der deutschen Industrie und Handelsunternehmen fuer Arzneimittel, Reformwaren und Koerperpflegemittel eV, Mannheim으로 부터 디 스켓 형태로 입수할 수 있는 "Europaeisches Inventar der Kosmetikrohstoffe", 1996에 기재되어 있다. Zviak, The Science of Hair Care, chapter 7, pages 248-250, and is published by The European Commission, which is available to the Bundesverband der deutschen Industrie und Handelsunternehmen fuer Arzneimittel, diskette form from Reformwaren und Koerperpflegemittel eV, Mannheim " Europaeisches Inventar der Kosmetikrohstoffe ", is described in 1996. 반영구적 염색에 대한 화학식(1)의 1 이상의 단일 염료와의 조합에 유용한 보다 바람직한 직접 염료는 다음과 같다: 2-아미노-3-니트로페놀, 2-아미노-4-히드록시에틸아미노-아니솔 술페이트, 2-아미노-6-클로로-4-니트로페놀, 2-클로로-5-니트로-N-히드록시에틸렌-p-페닐렌디아민, 2-히드록시에틸-피크람산, 2,6-디아미노-3-((피리딘-3-일)-아조)피리딘, 2-니트로-5-글리세릴-메틸아닐린, 3-메틸아미노-4-니트로-페녹시에탄올, 4-아미노-2-니트로디페닐렌아민-2'-카르복시산, 6-니트로-1,2,3,4,-테트라히드로퀸옥살린, 4-N-에틸-1,4-비스(2'-히드록시에틸아미노-2-니트로벤젠 히드로클로라이드, 1-메틸-3-니트로-4-(2'-히드록시에틸)-아미노벤젠, 3-니트로-p-히드록시에틸-아미노페놀, 4-아미노-3-니트로페놀, 4-히드록시프로필아민-3-니트로페놀, 히드록시안트릴아미노-프로필메틸 Preferred direct dyes more useful in combination with a single dye at least one of the formula (I) for the semi-permanent dyeing were as follows: 2-amino-3-nitrophenol, 2-amino-4-hydroxy-ethylamino-anisole alcohol sulfate, 2-amino-6-chloro-4-nitrophenol, 2-chloro-5-nitro -N- hydroxy-ethylene -p- phenylenediamine, 2-hydroxyethyl-peak ramsan, 2,6-diamino 3 - ((pyridin-3-yl) azo) pyridine, 2-nitro-5-glyceryl-methylaniline, 3-methylamino-4-nitro-phenoxyethanol, 4-amino-2-phenyl-knit Lodi alkylene amine-2'-carboxylic acid, 6-nitro -1,2,3,4-tetrahydro kwinok saline, 4-N- ethyl-1,4-bis (2'-hydroxy-ethyl-amino-2-nitrobenzene hydrochloride, 1-methyl-3-nitro-4- (2'-hydroxyethyl) aminobenzene, 3-nitro -p--hydroxyethyl-aminophenol, 4-amino-3-nitrophenol, 4-hydroxy hydroxypropyl amine-3-nitrophenol, hydroxyl cyan trill-amino-methyl 모르폴리노 메토술페이트, 4-니트로페닐-아미노에틸우레아, 6-니트로-p-톨루이딘, 에시드 블루 62, 에시드 블루 9, 에시드 레드 35, 에시드 레드 87 (에오신), 에시드 바이올렛 43, 에시드 옐로우 1, 베이식 블루 3, 베이식 블루 6, 베이식 블루 7, 베이식 블루 9, 베이식 블루 12, 베이식 블루 26, 베이식 블루 99, 베이식 브라운 16, 베이식 브라운 17, 베이식 레드 2, 베이식 레드 22, 베이식 레드 76, 베이식 바이올렛 14, 베이식 옐로우 57, 베이식 옐로우 9, 디스퍼스 블루 3, 디스퍼스 오렌지 3, 디스퍼스 레드 17, 디스퍼스 바이올렛 1, 디스퍼스 바이올렛 4, 디스퍼스 블랙 9, 패스트 그린 FCF, HC 블루 2, HC 블루 7, HC 블루 8, HC 블루 12, HC 오렌지 1, HC 오렌지 2, HC 레드 1, HC 레드 10-11, HC 레드 13, HC 레드 16, HC 레드 3, HC 레드 BN, HC 레드 7, HC 바이올렛 1, HC 바이올렛 2, HC 옐로우 2, HC 옐 Morpholino methoxy tosul sulfate, 4-nitro-phenyl-amino-ethyl urea, 6-nitro -p- toluidine, Acid Blue 62, Acid Blue 9, Acid Red 35, Acid Red 87 (Eosin), Acid Violet 43, Acid Yellow 1 , Basic blue 3, Basic blue 6, Basic blue 7, Basic blue 9, Basic blue 12, Basic blue 26, Basic blue 99, Basic Brown 16, Basic Brown 17, Basic Red 2, Basic Red 22, Basic Red 76, Basic Violet 14, Basic yellow 57, Basic yellow 9, Disperse blue 3, Disperse orange 3, Disperse Red 17, Disperse Violet 1, Disperse Violet 4 Disperse black 9, Fast green FCF, HC blue 2, HC blue 7, HC blue 8, HC blue 12, HC orange 1, HC orange 2, HC Red 1, HC Red 10-11, HC Red 13, HC Red 16, HC Red 3, HC Red BN, HC Red 7, HC Violet 1, HC Violet 2, HC yellow 2, HC CRAMAYEL 로우 5, HC 옐로우 5, HC 옐로우 6, HC 옐로우 7, HC 옐로우 9, HC 옐로우 12, HC 레드 8, 히드록시에틸-2-니트로-p-톨루이딘, N,N-비스-(2-히드록시에틸)-2-니트로-p-페닐렌디아민, HC 바이올렛 BS, 피크람산, 솔벤트 그린 7. Row 5, HC Yellow 5, HC Yellow 6, HC Yellow 7, HC Yellow 9, HC Yellow 12, HC Red 8, hydroxyethyl-2-nitro -p- toluidine, N, N- bis- (2-hydroxy ethyl) -2-nitro -p- phenylenediamine, HC Violet BS, peak ramsan, solvent green 7. R 1 은 벤질이고; R 1 is benzyl; R 2 는 메틸이며; R 2 is methyl; R 3 은 수소이고; R 3 is hydrogen; 또 X - 는 음이온임. Further X - is an anion Lim. 또한, 양이온 니트로아닐린 및 안트라퀴논 염료는 화학식(1)의 염료와 조합되기에 유용하며, 예컨대 상기 염료는 다음 특허문헌에 기재되어 있다: US-5 298 029호, 특히 칼럼 2, 33행∼칼럼 5, 38행; In addition, cationic nitroaniline and anthraquinone dyes are useful for being combined with the dye of formula (1), such as the dye are described in the following patent literature: US-5 298 029 Ho, especially column 2, line 33 - Column 5, line 38; US-5 360 930호, 특히 칼럼 2, 38행∼칼럼 5, 49행; US-5 360 930 Ho, especially column 2, line 38 - column 5, line 49; US-5 169 403호, 특히 칼럼 2, 30행∼칼럼 5, 38행; US-5 169 403 Ho, especially column 2, line 30 - column 5, line 38; US-5 256 823호, 특히 칼럼 4, 23행∼칼럼 5, 15행; US-5 256 823 Ho, especially column 4, line 23 - column 5, line 15; US-5 135 543, 특히 칼럼 4, 24행∼칼럼 5, 16행; US-5 135 543, especially column 4, line 24 - column 5, line 16; EP-A-818 193호, 특히 p. EP-A-818 193 Ho, especially p. 2, 40행∼p.3, 26행; 2, line 40 ~p.3, line 26; US-5 486 629호, 특히 칼럼 2, 34행∼칼럼 5, 29행; US-5 486 629 Ho, especially column 2, line 34 - column 5, line 29; 및 EP-A-758 547호, 특히 p. And EP-A-758 547 Ho, especially p. 7, 48행∼p.8, 19행. 7, line 48 ~p.8, line 19. 화학식(1)의 염료는 또한 산 염료, 이를테면 국제 명칭(Color index) 또는 상품명으로 알려진 염료와 조합될 수 있다. Dyes of the formula (I) may also be combined with acid dyes, for example the international names (Color index), or dyes known under the trade name. 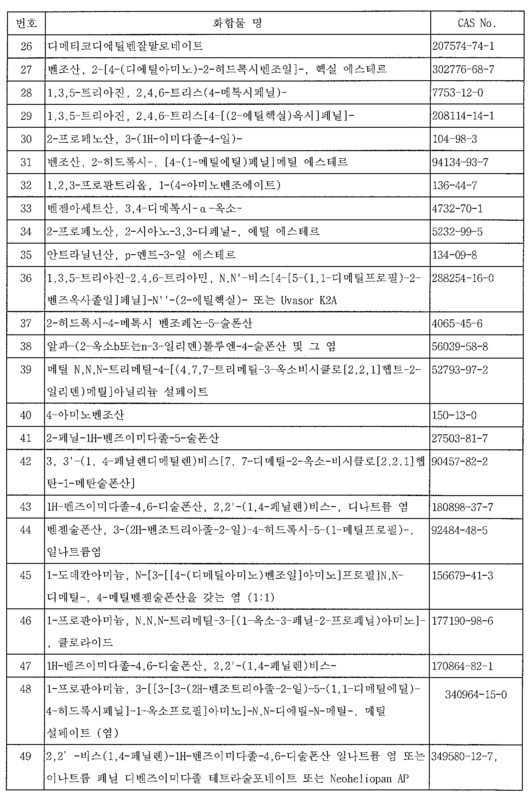 화학식(1)의 염료와 조합하기에 유용한 바람직한 산 염료는 미국특허 6,248,314호에 기재되어 있다. Preferred acid dyes useful for combination with a dye of formula (1) are described in US Patent No. 6,248,314. 이들은 레드 칼러 번호 120, 옐로우 칼러 번호 4, 옐로우 칼러 번호 5, 레드 칼러 번호 201, 레드 칼러 번호 227, 오렌지 칼러 번호 205, 브라운 칼러 번호 201, 레드 칼러 번호 502, 레드 칼러 번호 503, 레드 칼러 번호 504, 레드 칼러 번호 506, 오렌지 칼러 번호 402, 옐로우 칼러 번호 402, 옐로우 칼러 번호 406, 옐로우 칼러 번호 407, 레드 칼러 번호 213, 레드 칼러 번호 214, 레드 칼러 번호 3, 레드 칼러 번호 104, 레드 칼러 번호 105(1), 레드 칼러 번호 106, 그린 칼러 번호 2, 그린 칼러 번호 3, 오렌지 칼러 번호 207, 옐로우 칼러 번호 202(1), 옐로우 칼러 번호 202(2), 블루 칼러 번호 202, 블루 칼러 번호 203, 블루 칼러 번호 205, 블루 칼러 번호 2, 옐로우 칼러 번호 203, 블루 칼러 번호 201, 그린 칼러 번호 201, 블루 칼러 번호 1, 레드 칼러 번호 230(1), 레드 칼러 번호 231, 레드 칼러 번호 These Red Color No. 120, Yellow Color No. 4, Yellow Color No. 5, Red Color No. 201, Red Color No. 227, Orange Color No. 205, Brown Color No. 201, Red Color No. 502, Red Color No. 503, Red Color No. 504 , red color No. 506, orange color No. 402, yellow color No. 402, yellow color No. 406, yellow color No. 407, red color No. 213, red color No. 214, red color No. 3, red color No. 104, red color No. 105 1, Red color No. 106, green color No. 2, green color No. 3, orange color No. 207, yellow color No. 202 (1), yellow color No. 202 (2), blue color No. 202, blue color No. 203, blue color No. 205, blue color No. 2, yellow color No. 203, blue color No. 201, green color No. 201, blue color No. 1, Red color No. 230 (1), Red color No. 231, Red color No. 232, 그린 칼러 번호 204, 그린 칼러 번호 205, 레드 칼러 번호 401, 옐로우 칼러 번호 403(1), 그린 칼러 번호 401, 그린 칼러 번호 402, 블랙 칼러 번호 401 및 퍼플 칼러 번호 401, 특히 블랙 칼러 번호 401, 퍼플 Color 401, 오렌지 칼러 번호 205를 포함한다. 232, Green Color No. 204, Green Color No. 205, Red Color No. 401, Yellow Color No. 403 (1), Green Color No. 401, Green Color No. 402, Black Color No. 401 and Purple Color No. 401, especially Black Color No. 401 , a Purple Color 401, orange Color No. 205. 이들 산 염료는 단일 성분으로 또는 조합되어 사용될 수 있다. 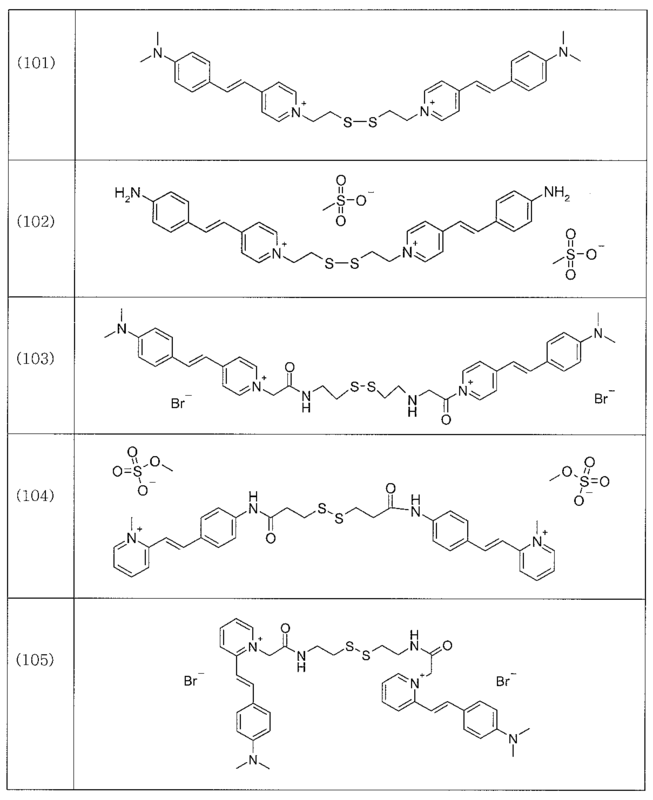 These acid dyes may be used either as single component or in combination. 산 염료를 포함하는 모발 염색 조성물은 공지되어 있다. Hair dye composition comprising an acid dye are known. 이들은 예컨대, Ch. These are, for example, Ch. Culnan, H. Maibach에 의해 편찬된 "Dermatology", Verlag Marcel Dekker Inc., New York, Basle, 1986, Vol.7, Ch. Culnan, with "Dermatology" compiled by H. Maibach, Verlag Marcel Dekker Inc., New York, Basle, 1986, Vol.7, Ch. Zviak, The Science of Hair Care, chapter 7, 248-250페이지, 특히 253 및 254페이지에 기재되어 있다. Zviak, The Science of Hair Care, chapter 7, pages 248-250, is especially described in pages 253 and 254. 산 염료를 포함하는 모발 염색 조성물의 pH는 2∼6, 바람직하게는 2∼5, 더욱 바람직하게는 2.5∼4.0이다. The pH of the hair dye compositions comprising an acid dye is 2 to 6, preferably from 2 to 5, and more preferably from 2.5 to 4.0. - 일본 특허출원 공개 53970/1998호 및 일본 특허공고 23911/1973호에 기재된 바와 같이 방향족 알코올, 저급 알킬렌 카보네이트의 수용성 중합체를 갖는 산 모발 염색 조성물. - Japanese Laid-Open Patent Application No. 53970/1998 and Japanese Patent Publication acid hair dye compositions with a water-soluble polymer of aromatic alcohols, lower alkylene carbonate as described in No. 23911/1973. 화학식(1)의 염료는 또한 비충전 염료, 이를테면 니트로아닐린, 니트로페닐렌디아민, 니트로아미노페놀, 안트라퀴논, 인도페놀, 펜아진, 페노티아진, 비스피라졸론, 비스피라졸 아자 유도체 및 메틴으로 이루어진 군으로부터 선택된 것과 조합될 수 있다. Dye of formula (1) is a also an unfilled dyes, such as nitro-aniline, nitro-phenylenediamine, nitro aminophenol, anthraquinone, indophenol, phenazine, phenothiazine, non Spirra isothiazolone, non Spirra sol-aza derivatives and methine It may be combined, such as those selected from the group consisting of. 또한, 화학식(1)의 염료는 산화 염료 시스템과 조합되어 사용될 수 있다. Further, the dye of formula (1) may be used in combination with oxidation dye systems. 초기 상태에서 염료가 아니고 염료 전구체인 산화 염료는 화학적 성질에 따라 현색제(developer) 및 커플러 화합물로 분류된다. Not a dye in an initial state of the oxidation dye precursor is a dye categorized as developing agent (developer), and a coupler compound, depending on the chemical nature. - Ch. - Ch. Culnan, H. Maibach에 의해 편찬된 "Dermatology", Verlag Marcel Dekker Inc., New York, Basle, 1986, Vol.7, Ch. Culnan, with "Dermatology" compiled by H. Maibach, Verlag Marcel Dekker Inc., New York, Basle, 1986, Vol.7, Ch. Zviak, The Science of Hair Care, chapter 8, p 264-267(산화 염료). Zviak, The Science of Hair Care, chapter 8, p 264-267 (oxidation dyes). 바람직한 현색제 화합물은 예컨대 파라- 또는 오르토-위치에서 치환 또는 비치환 히드록시- 또는 아미노 잔기에 의해 치환된 일급 방향족 아민, 또는 디아미노피리딘 유도체, 헤테로시클릭 히드라존, 4-아미노피라졸 유도체, 2,4,5,6-테트라아미노피리미딘 유도체, 또는 DE 19 717 224호, 특히 2 페이지, 50∼66행 및 3 페이지 8∼12행에 기재된 바와 같은 불포화 알데히드, 또는 WO 00/43367호 특히 2 페이지 27행∼8페이지 24행, 특히 9 페이지, 22행 내지 11페이지 6행에 기재된 양이온 현색제(developer) 화합물이다. Preferred developer compounds are for example para-or ortho-substituted at a position or unsubstituted hydroxy- or amino residue substituted aromatic amines by the top, or diaminopyridine derivatives, heterocyclic hydrazones, 4-aminopyrazole derivatives, 2,4,5,6- tetrahydro-amino-pyrimidine derivatives, or DE 19 717 224 Ho, especially on page 2, an unsaturated aldehyde as described in lines 50-66 and page 3 line 8 to 12, or No. WO 00/43367, especially page 2 line 27 to 8 on page 24 lines, in particular page 9, line 22 to cation-developing agent as described in page 11 line 6 (developer) compound. 또한, 히드로클로라이드 또는 술페이트와 같이 생리학적으로 이용가능한 산 부가염 형태인 현색제 화합물이 사용될 수 있다. Further, the hydrochloride or acid addition salt form of the color developer compounds used in the physiological, such as sulfate, may be used. 방향족 OH 라디칼을 갖는 현색제 화합물은 염기와 함께 알칼리 메탈페놀레이트와 같은 염 형태로 적합하다. Developer compound having an aromatic OH radicals are suitable as a salt form, such as an alkali metal phenolate with a base. 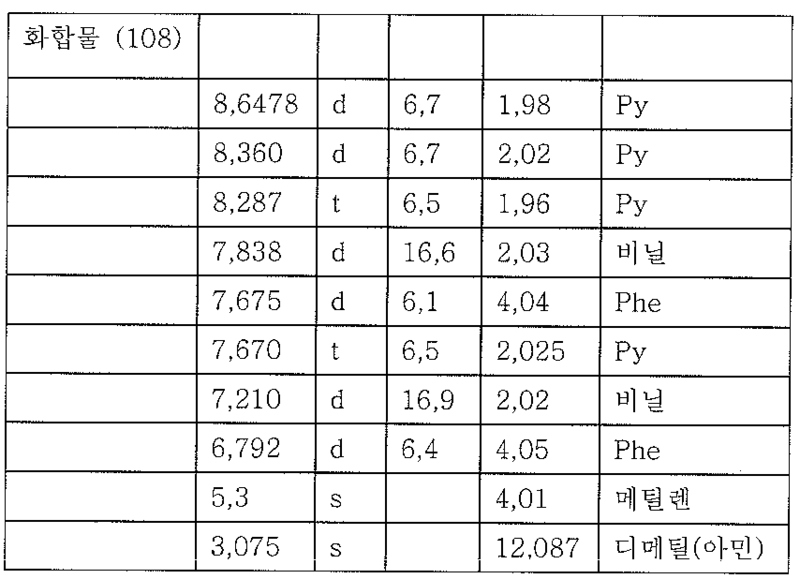 바람직한 현색제 화합물은 DE 19959479, p.2, 8∼29행에 기재되어 있다. Preferred developer compounds are described in DE 19959479, p.2, 8~29 line. 더욱 바람직한 현색제 화합물은 p-페닐렌디아민, p-톨루일렌디아민, p-, m-, o-아미노페놀, N,N-비스-(2-히드록시에틸)-p-페닐렌디아민 술페이트, 2-아미노-4-히드록시에틸아미노아니솔 술페이트, 히드록시에틸-3,4-메틸렌디옥시아닐린, 1-(2'-히드록시에틸)-2,5-디아미노벤젠, 2,6-디메톡시-3,5-디아미노-피리딘, 히드록시프로필-비스-(N-히드록시에틸-p-페닐렌디아민)히드로클로라이드, 히드록시에틸- p-페닐렌디아민 술페이트, 4-아미노-3-메틸페놀, 4-메틸아미노페놀 술페이트, 2-아미노메틸-4-아미노페놀, 4,5-디아미노-1-(2-히드록시에틸)-1H-피라졸, 4-아미노-m-크레솔, 6-아미노-m-크레솔, 5-아미노-6-클로로-크레솔, 2,4,5,6-테트라아미노피리미딘, 2-히드록시-4,5,6-트리아미노피리미딘 또는 4-히드록시-2,5,6-트리아미노피리미딘 술페이트이다. More preferred developer compounds are p- phenylenediamine, p- toluylene diamine, p-, m-, o- aminophenol, N, N- bis- (2-hydroxyethyl) -p- phenylenediamine sulfate 2-amino-4-hydroxy-ethylamino-anisole sulfate, hydroxyethyl-3,4-methylenedioxy aniline, 1- (2'-hydroxyethyl) -2,5-diaminobenzene, 2, 6-dimethoxy-3,5-diamino-pyridine, hydroxypropyl-bis - (N- hydroxyethyl -p- phenylenediamine) hydrochloride, hydroxyethyl-p- phenylenediamine sulfate, 4- amino-3-methylphenol, 4-methyl-aminophenol sulfate, 2-amino-4-aminophenol, 4,5-diamino-1- (2-hydroxyethyl) -1H- pyrazol, 4-amino -m- cresol, 6-amino -m- cresol, 5-amino-6-chloro-cresol, 2,4,5,6- tetra-aminopyrimidine, 2-hydroxy-4,5, 6- a tree-aminopyrimidine or 4-hydroxy -2,5,6--triamino-pyrimidine sulfate. 바람직한 커플러(coupler) 화합물은 m-페닐렌디아민 유도체, 나프톨, 레조르신 및 레조르신 유도체, 피라졸론 및 m-아미노페놀 유도체 및 가장 바람직하게는 DE 19959479, p.1, 33행∼p.3, 11행에 기재된 커플러 화합물이다. 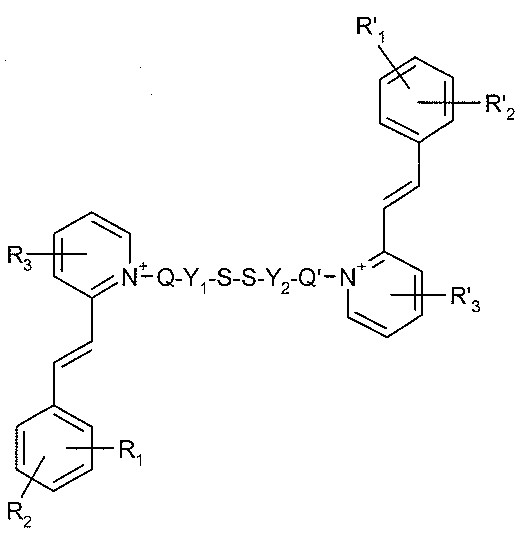 A preferred coupler (coupler) compound is m- phenylenediamine derivatives, naphthols, resorcinol and resorcinol derivatives, pyrazolone and m- aminophenol derivatives, and most preferably from DE 19959479, p.1, 33 ~p.3 line, a coupler compound as described in line 11. 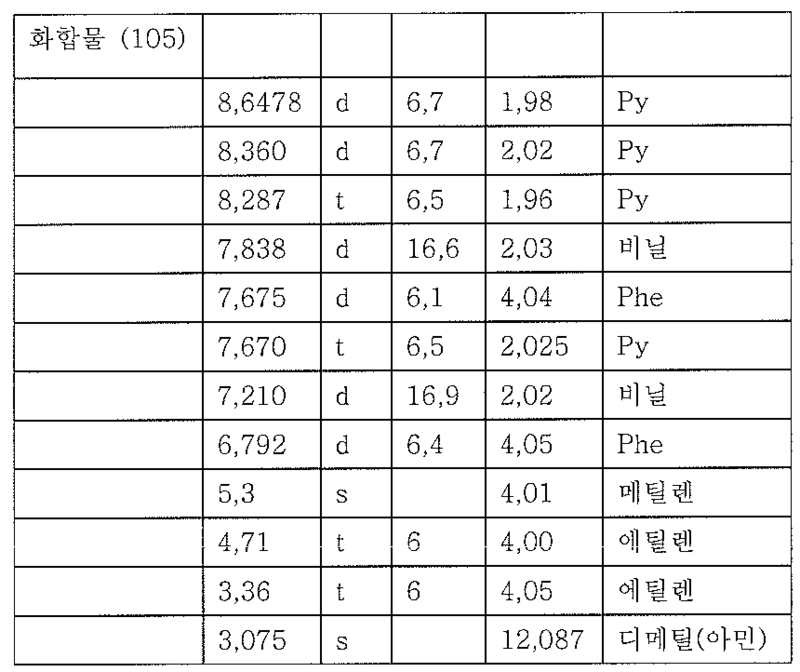 화학식(1)의 염료는 DE 19 717 224 (p.2, 50∼66행 및 p.3, 8∼12행)에 기재된 바와 같이 직접 염료로서 사용될 수 있거나, 아니면, 산화 염료 전구체와 함께 사용될 수 있는 불포화 알데히드와 함께 사용될 수 있다. Dye of formula (1) DE 19 717 224 may be used as direct dyes as described in (p.2, line 50~66 and p.3, line 8~12), or, it is used in combination with oxidation dye precursors which it may be used together with unsaturated aldehydes. - 갈색-금색 색조를 가하기 위한 p-톨루엔디아민 및 2-메틸레조르신. - Brown - p- toluene diamine and 2-methyl resorcinol for applying a gold color tone. 또한 자가 산화성(autooxidizable) 화합물이 화학식(1)의 염료와 조합되어 사용될 수 있다. In addition, the self-oxidizing (autooxidizable) compound may be used in combination with a dye of formula (1). 자가 산화성 화합물들은 매우 낮은 산화환원 잠재성을 가지므로 공기에 노출될 때 산화되는, 방향족 고리에 2 이상의 치환체를 갖는 방향족 화합물이다. Self-oxidizing compounds are highly aromatic compound because of the low oxidation-reduction potential of having two or more substituents on the aromatic ring is oxidized when exposed to air. 이들 화합물로 얻어진 염색은 매우 안정하고 샴푸에 대해 내성이 있다. Dyeing obtained with these compounds are very stable and resistant to shampoo. 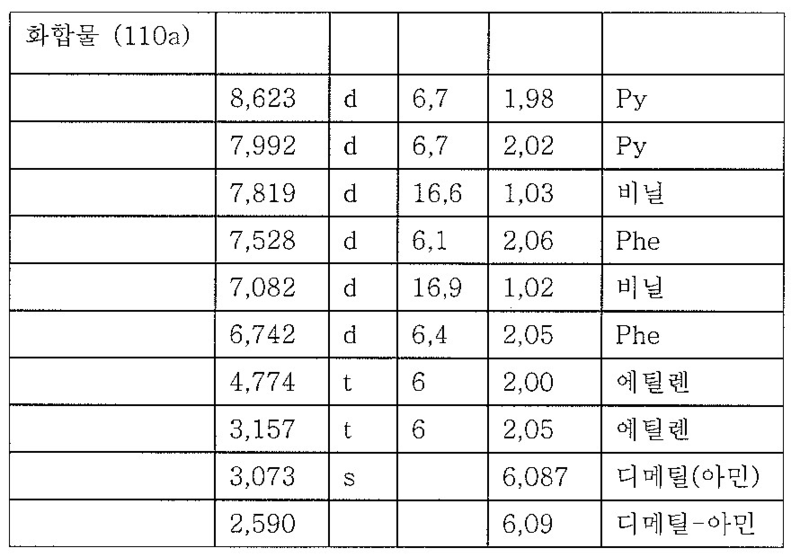 자가 산화성 화합물의 예로는 벤젠, 인돌, 특히 WO 99/20234호, 특히 p. Examples of the self-oxidizing compound is benzene, indole, in particular No. 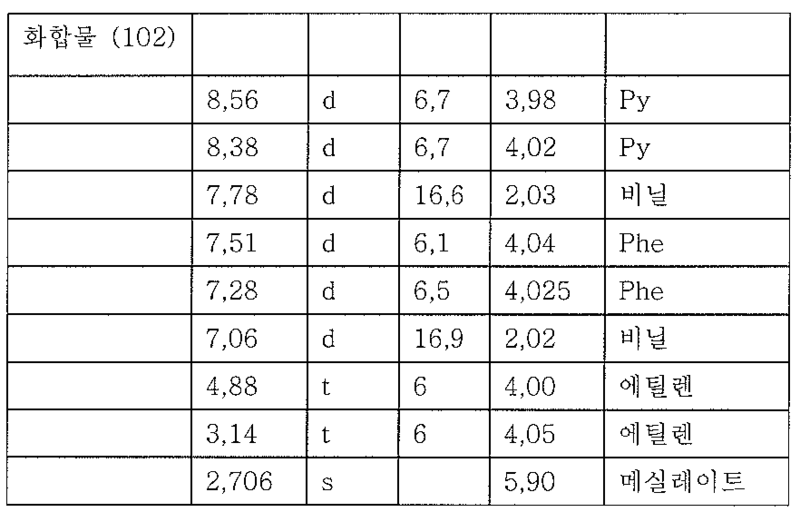 WO 99/20234, especially p. 26, 10행∼p.28, 15행, 또는 WO 00/28957호, p.2, 제3 문단에 기재된 5,6-디히드록시인돌 또는 5,6-디히드록시인돌린 유도체이다. 26, the 5,6-hydroxyindole or 5,6-dihydroxy derivative described in the turned ~p.28 line 10, line 15, or No. WO 00/28957, p.2, third paragraph. 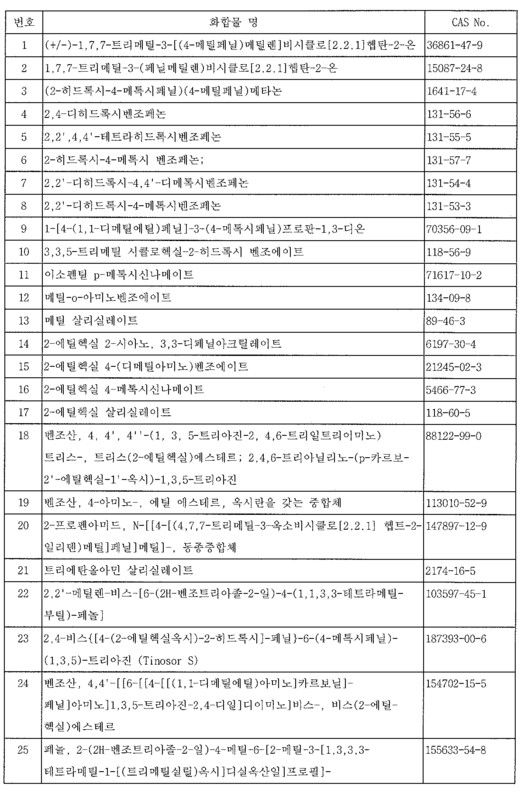 바람직한 자가 산화성 벤젠 유도체는 1,2,4-트리히드록시벤젠, 1-메틸-2,4,5-트리히드록시벤젠, 2,4-디아미노-6-메틸페놀, 2-아미노-4-메틸아미노페놀, 2,5-디아미노-4-메틸-페놀, 2,6-디아미노-4-디에틸아미노페놀, 2,6-디아미노-1,4-디히드록시벤젠, 및 산에 의해 얻을 수 있는 이들 화합물의 염이다. Preferred self-oxidizing a benzene derivative is 1,2,4-trihydroxy benzene, 1-methyl-2,4,5-trihydroxy benzene, 2,4-diamino-6-methylphenol, 2-amino-4 methyl-aminophenol, 2,5-diamino-4-methyl-phenol, 2,6-diamino-4-diethyl-aminophenol, 2,6-diamino-1,4-dihydroxybenzene, and the acid the salts of these compounds can be obtained by. 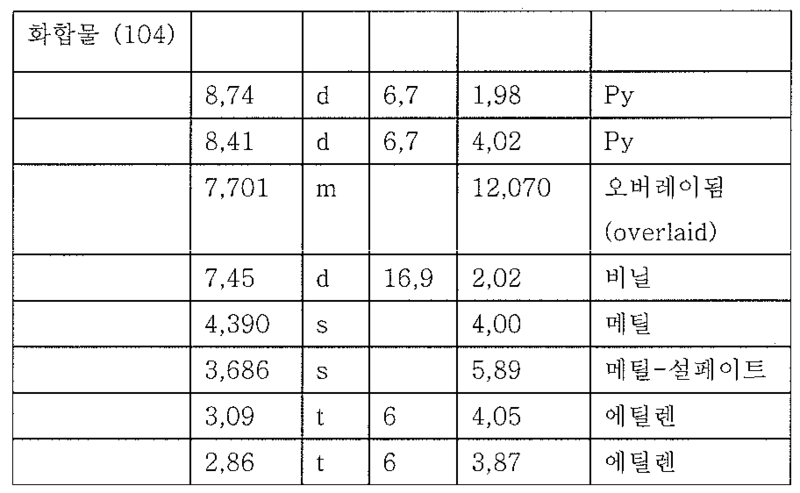 바람직한 자가산화성 인돌 유도체는 5,6-디히드록시인돌, 2-메틸-5,6-디히드록시인돌, 3-메틸-5,6-디히드록시인돌, 1-메틸-5,6-디히드록시인돌, 2,3-디메틸-5,6-디히드록시인돌, 5-메톡시-6-디히드록시인돌, 5-아세톡시-6-히드록시인돌, 5,6-디아세톡시인돌, 5,6-디히드록시인돌-2-탄산의 산, 및 산에 의해 얻을 수 있는 이들 화합물의 염이다. Preferred self-oxidizing an indole derivative is 5,6-hydroxyindole, 2-methyl-5,6-hydroxyindole, 3-methyl-5,6-hydroxyindole, 1-methyl-5,6- -hydroxyindole, 2,3-dimethyl-5,6-hydroxyindole, 5-di-methoxy-6-hydroxyindole, 5-acetoxy-6-hydroxyindole, 5,6-diacetoxy-indole a salt of these compounds can be obtained by an acid, and an acid of the 5,6-dihydroxy-indole-2-carbonic acid. 화학식(1)의 염료는 헨나 적색, 헨나 중성, 헨나 흑색, 카모밀 꽃, 백단향(sandalwood), 홍차, 람누스 프란굴라( Rhamnus Dye of formula (1) is henna red, henna neutral, henna black, car Chamomile Flowers, sandalwood (sandalwood), black tea, valerian person Francisco arugula (Rhamnus frangula ) 나무껍질, 샐비어(sage), 캄페체 나무, 서양꼭두서니(madder) 뿌리, 카테츄(catechu), 세드레(sedre) 및 알카넷 뿌리와 같은 천연 염료와 함께 사용될 수 있다. frangula) can be used with bark, salvia (sage), Campeche Wood, Western Akane (madder) roots, category Picchu (catechu), three Dre (sedre) and Al natural dyes such as Canet roots. 이러한 염색 방법은 예컨대 EP-A-404 868호, 특히 3페이지, 55행∼4페이지 9행에 기재되어 있다. This dyeing method is for example disclosed in EP-A-404 868 Ho, especially page 3, line 55 page 10 line to 4. 또한, 화학식(1)의 염료는 캡핑된(capped) 디아조화 화합물과 조합되어 사용될 수 있다. Further, the dye of formula (1) may be used in combination with capped (capped) diazotizing the compound. 적합한 디아조화 화합물은 WO 2004/019897호(페이지 1과 2의 연결 부분)에 기재된 화학식(1)∼(4)의 화합물과 동 문헌에 기재된 대응하는 수용성 커플링 성분(I)-(IV)이 있다. Suitable diazotizing compounds No. 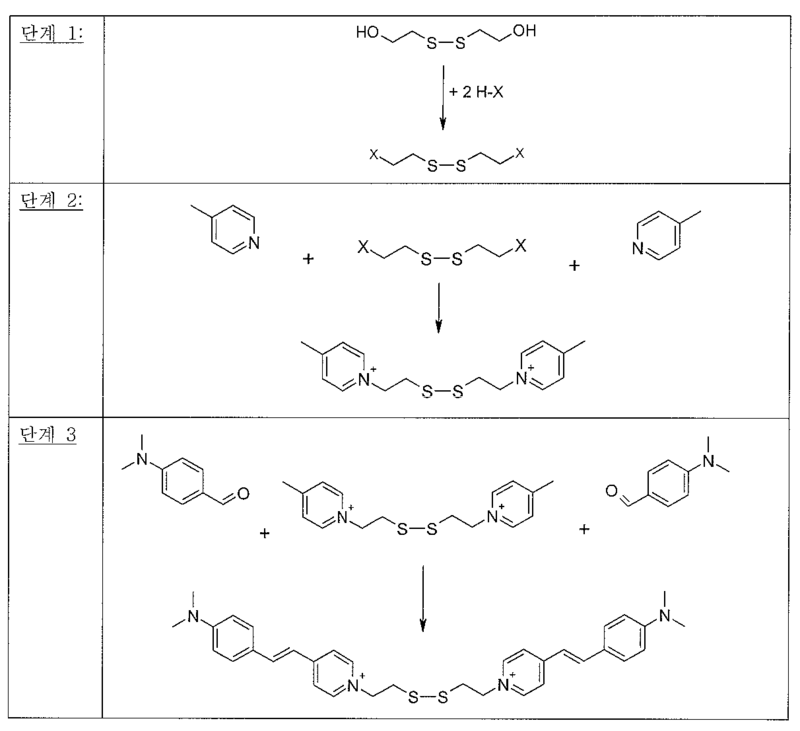 WO 2004/019897 (pages 1 and 2 of the connection part), the formula (1) to (4) compound and the corresponding water-soluble coupling component, which described in the literature such as described in (I) - (IV) is have. ( DC -18): DE 197 172 24호, 불포화 알데히드 및 커플러 화합물 및 1급 및 2급 아미노기 화합물, 질소-함유 헤테로사이클 화합물, 아미노산, 올리고펩티드, 방향족 히드록시 화합물, 및/또는 1 이상의 CH-활성 화합물을 포함하는 염색제가 p3, 42행∼p5 25행에 기재되고, 염색 배합물은 p8, 25행∼p9, 61행에 기재됨. (DC -18): DE 197 172 24 No., unsaturated aldehydes and coupler compounds and primary and secondary amino group compounds, nitrogen-containing heterocyclic compounds, amino acids, oligopeptides, aromatic hydroxy compounds, and / or one or more CH- search the dye comprising the active compound and described the line p3, line 42 ~p5 25, dyeing formulations p8, line 25 shown in ~p9, 61 rows. 상기 참고문헌(DC-01 - DC-18)에 기재된 염료 조합물에서, 본 발명에 따른 화학식(1)의 염료는 상기 염료 조합물 또는 염색 배합물에 부가될 수 있거나 또는 화학식(1)의 1 이상의 염료에 의해 교체될 수 있다. The references (DC-01 - DC-18) from the dye combinations disclosed, the dye of the formula (I) according to the invention at least one of the number, or the general formula (1) be added to the dye combinations or dyeing formulations It may be replaced by a dye. (c) 보조제 0.01∼20 중량%. 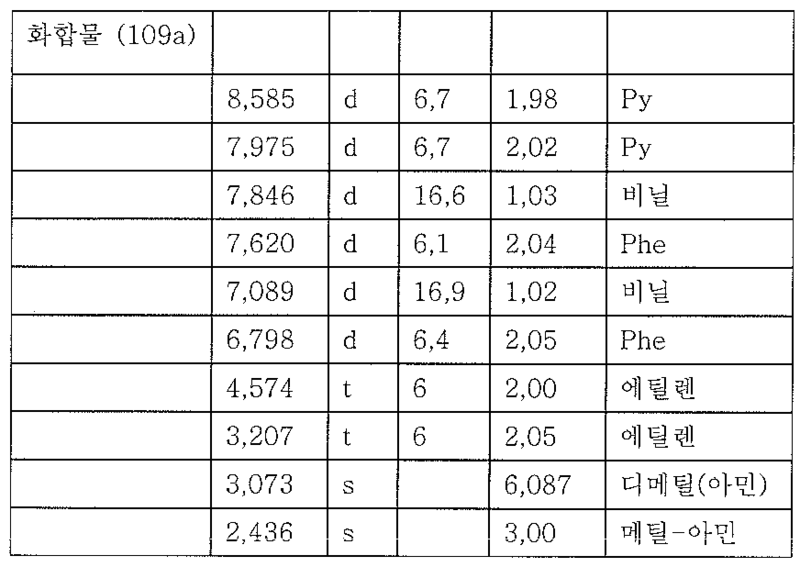 (C) adjuvants 0.01~20% by weight. 상기 배합물은 상이한 기술 형태로 케라틴-함유 섬유, 바람직하게는 인간 모발 상에 도포될 수 있다. The formulations of different technologies to form keratin-containing fibers that, preferably, can be applied onto human hair. 배합물의 기술 형태는 예컨대 용액, 특히 진한 수성 또는 수성 알코올 용액, 크림, 포옴, 샴푸, 분말, 겔 또는 에멀젼이다. Technical forms of formulations are for example a solution, especially in concentrated aqueous or aqueous alcohol solution, cream, foam, shampoo, powder, gel or emulsion. 통상적으로 염색 조성물은 50∼100g의 양으로 케라틴-함유 섬유에 도포된다. Typically dyeing keratin composition in an amount of 50~100g - is applied to the fiber-containing. 본 발명의 염색 조성물은 25∼200℃, 바람직하게는 18∼80℃, 가장 바람직하게는 20∼40℃의 온도 범위에서 모발 상에 도포된다. Dyeing composition of the present invention is applied on the hair in a temperature range of 20~40 ℃ most preferably 25~200 ℃, preferably 18~80 ℃,. 배합물의 바람직한 형태는 즉시 사용 가능한 조성물 또는 미국특허 6,190,421호, 칼럼 2, 16∼31행에 기재된 바와 같은 다구획 염색 장치 또는 "키트" 또는 다른 다구획 포장 시스템이다. A preferred form of the formulation is a multi-compartment dyeing device or "kit" or any other multi-compartment packaging system, such as ready-to-use compositions, or U.S. Patent No. 6,190,421, column 2, lines 16-31 described in. 케라틴 함유 섬유, 바람직하게는 모발에 화학식(1)의 염료를 포함하는 배합 물을 도포하는 한 가지 바람직한 방법은 WO 97/20545호, p.4, 19∼27행에 기재된 바와 같이, 다구획 염색장치 또는 "키트" 또는 기타 다구획 포장 시스템을 이용함으로써 실시한다. Preferably keratin-containing fibers, particularly as one preferred method for applying the combination of water containing a dye of the formula (I) to the hair are described in WO 97/20545 No., p.4, line 19~27, the dyeing compartment the device or "kit" or any other, is performed by using a compartment packaging system. 제1 구획은 화학식(1)의 염료 적어도 하나 및 임의로는 추가적인 직접 염료 및 염기화제를 함유하고, 제2 구획은 산화제를 함유하거나; The first compartment contains at least one dye and optionally further direct dyes and a base agent of formula (1), a second compartment containing an oxidizing agent, or; 또는 제1 구획에는 적어도 하나의 화학식(1)의 염료 및 임의로는 추가적인 직접 염료를 함유하고, 제2 구획에는 염기화제 및 제3 구획에는 산화제를 함유한다. Or the first compartment containing at least one dye and optionally additional direct and contains a dye, a second compartment contains a base agent and a third compartment contains the oxidizing agent of the formula (I). 즉시 사용할 수 있는 염색 조성물의 pH값은 통상 2∼11, 바람직하게는 5∼10이다. Immediately the pH value of the dyeing composition that can be used is usually 2-11, preferably 5-10. 바람직하게는, 환원에 안정하지 않은 염색 조성물은 염색 공정 직전에 무 산화제 조성물로 제조된다. Preferably, the dyeing compositions are not stable to reduction are prepared just before the dyeing process with an oxidizing agent free composition. 본 발명의 바람직한 구체예는 염료의 배합물에 관한 것이고, 이때 화학식(1)의 염료는 분말 형태이다. A preferred embodiment of the present invention is a dye in powder form relates to the formulation of dyes, wherein the formula (1). 분말 배합물은 이를테면 DE 197 13 698, p2, 26∼54행 및 p3, 51행∼p4, 25 행 및 p4, 41행∼p5, 59행에 기재된 바와 같이 안정성 및/또는 용해성 문제가 있는 경우 바람직하게 사용된다. The powder formulation is preferably for example DE 197 13 698, p2, 26~54, if the row and p3, line 51 ~p4, with the stability and / or solubility problems as described in line 25, and p4, line 41 ~p5, 59 line It is used. 적합한 화장용 헤어케어 배합물은 모발 처리 제제, 예컨대 샴푸 및 콘디쇼너 형태의 모발 세정 제제, 예비 처리 제제와 같은 헤어 케어 제제 또는 스프레이, 크림, 젤, 로션, 무스 및 오일과 같은 리브-온(leave-on) 제품, 헤어 토닉, 스타일링 크림, 스타일링 젤, 포마드, 헤어 린스, 트리트먼트 팩, 인텐시브 헤어 트리트먼 트, 헤어 스트럭쳐링 제제, 예컨대 퍼머 웨이브를 위한 헤어 웨이브 제제(핫 웨이브, 마일드 웨이브, 콜드 웨이브), 헤어 스트레이트 제제, 액체 헤어 세팅 제제, 헤어 포옴, 헤어스프레이, 탈색 제제, 예컨대 과산화수소 용액, 라이트닝 샴푸, 탈색 크림, 탈색 분말, 탈색 페이스트 또는 오일, 일시적, 세미 퍼머 또는 퍼머 헤어 착색제, 자가 산화 염료를 함유하는 제제, 또는 헨나 또는 카모마일과 같은 천연 헤어 착색제이다. Suitable cosmetic hair-care formulations are hair treatment preparations, such as shampoos and conditioning syoneo form of hair washing preparations, such as hair care agents or sprays, creams, gels, lotions, mousses and oils, such as pre-treatment agents rib-On (leave- on) products, hair tonics, styling creams, styling gels, pomade, hair rinses, treatment packs, intensive hair treatments hair wave preparations for a distant tree, hair structured ring preparations, such as permanent waves (hot wave, mild wave, cold wave ), hair-straightening preparations, liquid hair-setting preparations, hair foams, hair sprays, bleaching agents such as hydrogen peroxide solutions, lightening shampoos, bleaching creams, bleaching powders, bleaching pastes or oils, temporary, semi-permanent or permanent hair colorants, self-oxidizing dyes a natural hair colorants, such as agents, or henna or camomile containing. 인간 모발에 사용하기 위하여, 본 발명의 염색 조성물은 수성 화장품 담체 상에 혼입될 수 있다. For use in human hair dyeing compositions of the present invention it may be incorporated in the water-based cosmetic carrier. 적합한 수성 화장품 담체는 예컨대 W/O, O/W, O/W/O, W/O/W 또는 PIT 유제 및 모든 유형의 마이크로유제, 크림, 스프레이, 유제, 젤, 파우더 및 계면활성제 함유 포옴 용액, 예컨대 샴푸 또는 기타 제제이며, 이들은 케라틴 함유 섬유에 사용하기에 적합하다. Containing foam solution Suitable aqueous cosmetic carriers include, for example W / O, O / W, O / W / O, W / O / W or PIT emulsion and all kinds of microemulsions, creams, sprays, emulsions, gels, powders and surfactants , for example, a shampoo or other agents, all of which are suitable for use on keratin-containing fibers. 이러한 사용형태는 Research Disclosure 42448 (1999년 8월)에 자세하게 기재되어 있다. Use this form are described in detail in Research Disclosure 42448 (August 1999). 필요한 경우, 미국특허 3 369 970호, 특히 칼럼 1, 70행∼칼럼 3, 55행에 기재된 바와 같이 염색 조성물을 무수 담체에 혼입할 수 있다. If necessary, it is possible to incorporate the dyeing compositions into anhydrous carriers, as described in U.S. Patent No. 3 369 970, especially column 1, line 70 - column 3, line 55 described. 본 발명에 따른 염색 조성물은 염색 빗 또는 염색 브러시를 사용한 DE-A-3 829 870호에 기재된 염색 방법에 아주 적합하다. Dyeing composition according to the invention is very suitable for the dyeing method described in DE-A-3 829 870 using a dyeing comb or a dyeing brush arc. 수성 담체의 성분은 본 발명의 염색 조성물에 통상의 양, 예컨대 전체 염색 조성물의 0.5∼30 중량%의 농도로 염색 조성물에 존재하고 또 증점제는 전체 염색 조성물의 0.1∼25 중량%의 농도로 존재한다. Component of the aqueous carrier is generally the amount of the dyeing compositions, such as present in the dyeing compositions in a concentration of 0.5 to 30% by weight of the total dyeing composition, and also the thickener of the present invention is present in a concentration of 0.1~25% by weight of the total dyeing composition . 염색 조성물에 대한 다른 담체는 Ch. Other carriers for dyeing compositions Ch. Culnan, H. Maibach에 의해 편찬된 "Dermatology", Verlag Marcel Dekker Inc., New York, Basle, 1986, Vol. Culnan, with "Dermatology" compiled by H. Maibach, Verlag Marcel Dekker Inc., New York, Basle, 1986, Vol. 7, Ch. 7, Ch. Zviak, The Science of Hair Care, chapter 7, p. Zviak, The Science of Hair Care, chapter 7, p. 248-250, 특히 p.243, 1행∼p.244, 12행에 기재되어 있다. 248-250, especially p.243, lines 1 ~p.244, are described in the 12th row. 물 100% 이루도록 부가. Additional achieve 100% water. 화학식(1)의 염료는 액체 내지 페이스트상 제제(수성 또는 비수성) 또는 무수 분말 형태로 저장될 수 있다. Dye of formula (1) it may be stored in a liquid to paste-like preparation (aqueous or non-aqueous) or dry powder form. 염료 및 보조제를 액체 제제로 저장할 때, 이 제제는 화합물의 반응을 줄이기 위하여 실질적으로 무수이어야 한다. When saving the dye and the auxiliary agent to the liquid preparation, the preparation should be substantially anhydrous in order to reduce reaction of the compounds. 본 발명에 따른 염색 조성물은 활성 성분, 이러한 제제용으로 공지된 첨가제 또는 보조제, 예컨대 계면활성제, 용매, 염기, 산, 향수, 중합성 보조제, 농축제 및 광안정화제를 포함할 수 있다. Dyeing composition according to the invention may comprise the active ingredient, well-known additives for such formulations or aids, such as surfactants, solvents, bases, acids, perfumes, polymeric adjuvants, thickeners and light stabilizers. UV 흡수제의 사용은 천연 및 염색 모발을 햇빛에 의한 손상으로부터 효과적으로 보호할 수 있고 염색된 모발의 세척 견뢰도를 증가시킬 수 있다. The use of the UV absorber may increase the wash fastness of dyed hair and to protect effectively the natural and dyed hair from damage caused by sunlight. -2,4,4'-트리클로로-2'-히드록시디페닐 에테르, 클로르헥시딘 (1,6-디(4-클로로페닐-비구아니도)헥산) 또는 TCC (3,4,4'-트리클로로카르바닐리드)와 같은 그램 양성 세균에 대한 특수한 작용을 갖는 보존제와 같은 세균 억제제. A -2,4,4'- trichloro-2'-hydroxydiphenyl ether, chlorhexidine (1,6-di (4-chloro-phenyl-acetabular not even) hexane) or TCC (3,4,4'- trichloro Roca Le bacterial agents such as preservatives having a special activity against such gram-positive bacteria and banil lead). 다수의 방향족 물질 및 에테르성 오일이 항미생물 특성을 갖는다. A number of aromatic substances and ethereal five days has antimicrobial properties. 전형적인 예는 클로브 오일, 민트 오일 및 타임 오일 중의 활성성분 오이게놀, 멘톨 및 티몰이다. Typical examples are the active ingredients eugenol, menthol and thymol in clove oil, mint oil and time oil. 관심을 두고 있는 천연 탈취제는 라임 꽃 오일에 존재하는 테르펜 알코올 파르네솔 (3,7,11-트리메틸-2,6,10-도데카트리엔-1-올)이다. Natural deodorant is terpene alcohol concerned in Parr nesol (3,7,11 -2,6,10- dodecyl cartridge en-1-ol) that is present in lime blossom oil. 글리세롤 모노라우레이트는 정균제(bacteriostatic agent)인 것으로 밝혀졌다. Glycerol monolaurate has been found to be bacteriostatic (bacteriostatic agent). 존재하는 부가적인 세균 억제제의 양은 통상 제제의 고체 함량을 기준으로 하여 0.1∼2 중량%이다. Based on the presence of additional solids content formulations usually the amount of bacterial inhibitor is 0.1 to 2% by weight. 본 발명에 따른 염색 조성물은 일반적으로 1 이상의 계면활성제를 포함한다. Dyeing composition according to the invention generally include one or more surfactants. 적합한 계면활성제는 쯔비터이온 또는 양쪽성, 또는 보다 바람직하게는 음이온성, 비이온성 및/또는 양이온성 계면활성제이다. Suitable surfactants are zwitterionic or ampholytic, or more preferably anionic, non-ionic and / or cationic surfactants. 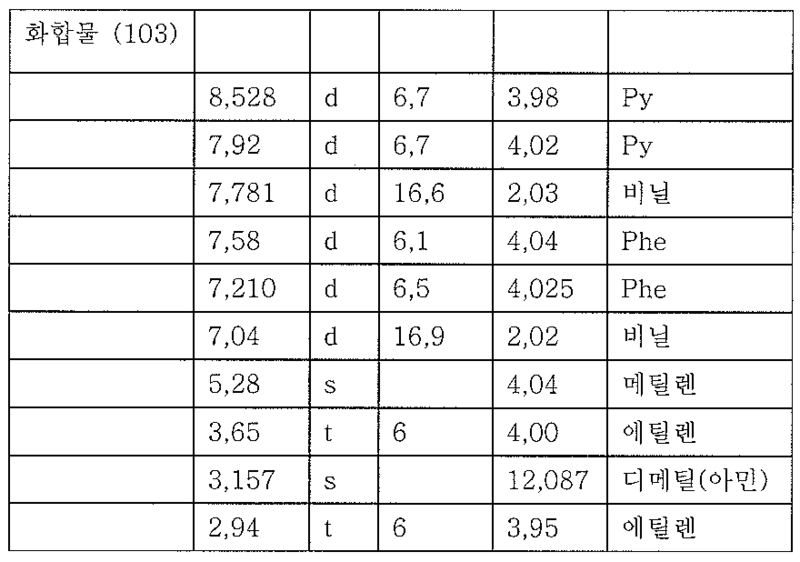 - WO 00/10518호, 특히 p.45, 11행∼p.48, 3행에 기재된 바와 같은 음이온성 계면활성제. - anion as described in WO 00/10518 arc, especially p.45, line 11 ~p.48, 3 rows surfactant. 바람직한 음이온성 계면활성제는 알킬기에 10∼18개 탄소원자를 갖고 또 분자내에 12개 이하의 글리콜 에테르 기를 갖는 알킬 술페이트, 알킬 폴리글리콜 에테르 술페이트 및 에테르 카르복시산, 특히 올레산, 스테아르산, 이소스테아르산 및 팔미트산과 같은 포화 및 특히 불포화 C 8 -C 22 카르복시산의 염이다. Preferred anionic surfactants include those having 10-18 carbon atoms in the alkyl group also having a glycol ether of less than 12 in the molecule, sulfates, alkyl polyglycol ether sulfates and ether carboxylic acids, in particular oleic acid, stearic acid, isostearic acid and salts of saturated and especially unsaturated C 8 -C 22 carboxylic acids such as palmitic acid. 분자 내에 1 이상의 4급 암모늄 기 및 1 이상의 -COO - 또는 -SO 3 - 기를 갖는 계면활성 화합물을 "쯔비터이온성 계면활성제"라 칭한다. Or -SO 3 - - 1 or more than one quaternary ammonium group and a 1 -COO within the molecule a surface-active compound having a group referred to as "zwitterionic surfactants". N-알킬-N,N-디메틸암모늄 글리시네이트와 같은 소위 베타인, 예컨대 코코알킬디메틸암모늄 글리시네이트, N-아실아미노프로필-N,N-디메틸암모늄 글리시네이트, 예컨대 코코아실아미노프로필디메틸암모늄 글리시네이트, 및 알킬 또는 아실 기내에 8∼18개 탄소원자를 갖는 2-알킬-3-카르복시메틸-3-히드록시에틸이미다졸린 및 또한 코코아실아미노에틸히드록 시에틸카르복시메틸 글리시네이트가 바람직하다. N- alkyl -N, N- dimethyl ammonium glycinate so-called betaines, such as coco-alkyl dimethyl carbonate, such as ammonium glycinate, N- acylamino propyl -N, N- dimethyl ammonium glycinate, for example, cocoa chamber aminopropyl dimethyl ammonium glycinate, and 2-alkyl, or alkyl having from 8-18 carbon atoms in the acyl-flight-3-carboxymethyl-3-hydroxyethyl-imidazole sleepy and also cocoa chamber aminoethyl-hydroxy ethyl when lock carboxymethyl glycinate it is preferred. 바람직한 쯔비터이온성 계면활성제는 CTFA 명칭 코코아미도프로필 베타인으로 공지된 지방산 아미드 유도체이다. A preferred zwitterionic surfactant is the fatty acid amide derivative known by the CTFA name of cocoa shown propyl betaine. 양쪽성 계면활성제는 C 8 -C 18 -알킬 또는 -아실 기 이외에, 분자내에 1 이상의 자유 아미노 기 및 1 이상의 -COOH 또는 -SO 3 H 기를 함유하며 내부염을 형성할 수 있는 계면-활성 화합물로서 이해된다. Amphoteric surfactants are C 8 -C 18 - alkyl or - acyl group in addition to, containing an at least one free amino group and at least one -COOH or -SO 3 H in the molecule, and surfactants capable of forming an inner salt - as the active compound It is understood. 적합한 양쪽성 계면활성제의 예는 N-알킬글리신, N-알킬프로피온산, N-알킬아미노부티르산, N-알킬이미노디프로피온산, N-히드록시에틸-N-알킬아미도프로필글리신, N-알킬타우린, N-알킬사르코신, 2-알킬아미노프로피온산 및 알킬아미노아세트산을 포함하며, 이들 각각은 알킬기 내에 약 8∼18개 탄소원자를 갖는다. Examples of suitable ampholytic surfactants are N- alkyl glycine, N- alkyl acid, N- alkyl amino acid, N- alkyl iminodiacetic acid, N- hydroxyethyl -N- alkyl amido propyl glycine, N- alkyl taurine, N- alkyl includes sarcosine, 2-alkyl-aminopropionic acid and an alkyl amino acid, each of which has about 8-18 carbon atoms in the alkyl group. 특히 바람직한 양쪽성 계면활성제는 N-코코알킬아미노프로피오네이트, 코코아실아미노에틸아미노프로피오네이트 및 C 12 -C 18 아실사르코신이다. Particularly preferred ampholytic surfactants are N- coco-alkyl amino propionate, cocoa chamber aminoethyl amino propionates and the C 12 -C 18 acyl sarcosine. - 에틸렌 옥사이드와 지방산 알칸올아미드의 부가 생성물. - addition products of ethylene oxide with fatty acid alkanolamides. 에틸렌 및/또는 프로필렌 옥사이드와 지방 알코올의 부가 생성물 또는 이러한 부가 생성물의 유도체인 계면활성제는 "정상" 동족(homologue) 분포를 갖는 생성물이거나 또는 제한된 동족 분포를 갖는 생성물일 수 있다. May be ethylene and / or propylene oxide with a surfactant derivatives of these addition products or addition products of fatty alcohols may be a product having a "normal" homologous (homologue) distribution or products having a restricted cognate distribution. "정상" 동족 분포는 알칼리 금속, 알칼리 금속 수산화물 또는 알칼리 금속 알코올레이트를 촉매로 사용한 지방 알코올과 알킬렌 옥사이드의 반응에서 얻어진 동족의 혼합물을 의미하는 것으로 이해된다. "Normal" homologous distribution is understood to mean a mixture of homologous obtained from the reaction of an alkali metal, an alkali metal hydroxide or alkali metal alcoholate to the fatty alcohol and alkylene oxide using a catalyst. 반면에, 제한된 동족 분포는 예컨대 히드로탈사이트, 에테르 카르복시산의 알칼리 금속 염, 알칼리 금속 산화물, 수산화물 또는 알코올레이트를 촉매로 사용할 때 얻어진다. On the other hand, limited homologous distribution, for example hydrochloride is obtained hydrotalcite, when using the ether carboxylic acid of an alkali metal salt, an alkali metal oxide, hydroxide or alcoholate as the catalyst. 제한된 동족 분포를 갖는 생성물의 사용이 바람직하다. The use of products having restricted cognate distribution is preferred. 본 발명에 따른 염색 조성물에 사용될 수 있는 양이온성 계면활성제의 예는 특히 4급화된 암모늄 화합물이다. Examples of cationic surfactants that can be used in the dyeing compositions according to the present invention are ammonium compounds, particularly quaternized. 알킬트리메틸암모늄 클로라이드, 디알킬디메틸암모늄 클로라이드 및 트리알킬메틸암모늄 클로라이드와 같은 암모늄 할라이드, 예컨대 세틸트리메틸암모늄 클로라이드, 스테아릴트리메틸암모늄 클로라이드, 디스테아 릴디메틸암모늄 클로라이드, 라우릴디메틸암모늄 클로라이드, 라우릴디메틸벤질암모늄 클로라이드 및 트리세틸메틸암모늄 클로라이드이다. Alkyltrimethylammonium chloride, dialkyldimethylammonium chloride and tri ammonium halides, such as alkyl methyl ammonium chlorides, for example cetyl trimethyl ammonium chloride, stearyl trimethyl ammonium chloride, distearyl dimethyl ammonium chloride, lauryl dimethyl ammonium chloride, lauryl dimethyl benzyl ammonium chloride and a tree cetyl dimethyl ammonium chloride. 본 발명에 따라 사용될 수 있는 양이온성 계면활성제는 4급화된 단백질 가수분해물이다. Cationic surfactants that may be used in accordance with the present invention is a quaternized protein hydrolyzate. 본 발명에 따라 또한 적합한 것은 양이온성 실리콘 오일, 예컨대 시판되는 제품 Q2-7224 (제조사: 다우 코닝: 안정화된 트리메틸실릴아모디메티콘), 다우 코팅 929 에멀젼 (히드록시아미노-변성된 실리콘 함유, 이후 아모디메티콘으로 칭함), SM-2059 (제조사: 제네랄 일렉트릭), SLM-55067 (제조사: Wacker) 및 Abil R -Quat 3270 및 3272 (제조사: Th. 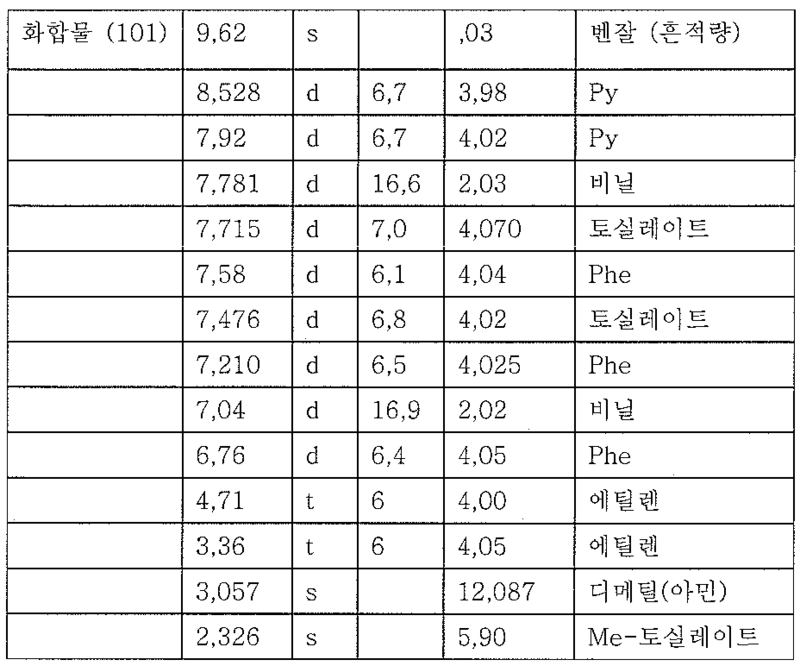 Goldschmidt; 디4급화된 폴리디메틸실옥산, 쿼터늄-80) 또는 WO 00/12057, 특히 45페이지, 9행∼55페이지 2행에 기재된 바와 같은 실리콘이다. It is also suitable in accordance with the present invention, the cationic silicone oils, such as the commercially available products Q2-7224 (manufacturer: Dow Corning: a stabilized trimethyl silyl O-modify dimethicone), Dow coating 929 emulsion (hydroxymethyl amino-modified silicon-containing, after Oh referred to as Modi methicone), SM-2059 (manufacturer: General electric), SLM-55067 (manufacturer: Wacker) and Abil R -Quat 3270 and 3272 (manufacturer:. Th Goldschmidt; di quaternized with polydimethylsiloxane, quota is the silicon as described in titanium -80) or WO 00/12057, especially page 45, line 9 ~55 page 2 line. 알킬아미도아민, 특히 상표명 Tego Amid ® 18로 입수할 수 있는 스테아릴아미도프로필디메틸아민과 같은 지방산 아미도아민은, 본 발명의 염색 조성물에 계면활성제로서 바람직하다. Alkyl amido amines, especially under the trade name Fatty amido amines such as dimethyl amine, stearyl amido propyl and also available as Tego Amid ® 18 are preferred as a surfactant in the dyeing composition of the present invention. 이들은 양호한 콘디셔닝 작용 뿐만 아니라 양호한 생분해성을 특징으로 한다. These are good conditioning action but also features a good biodegradability. 4급화 에스테르 화합물, 소위 "에스테르쿼츠", 예컨대 상표명 Stepantex ® 으로 입수할 수 있는 메틸 히드록시알킬디알코일옥시알킬암모늄 메토술페이트는 매우 용이하게 생분해될 수 있다. Quaternary ester compounds, so-called "quartz ester", for example, under the trade name methylhydroxy available as Stepantex ® hydroxyalkyl Diallo coil oxyalkylene ammonium methoxy tosul sulfates can be very easily biodegradable. 양이온성 계면활성제로 사용될 수 있는 4급화 당 유도체의 예는 CTFA 명명법에 따라서 "라우릴 메틸 글루세트-10 히드록시프로필 디모늄 클로라이드"로 불리는 상표명 Gluquat ® 100 이다. Examples of cationic quaternary sugar derivatives which can be used as a surface active agent is a trade name Gluquat ® 100, known as "lauryl-methylglucamine set -10 hydroxypropyl dimonium chloride" according to the CTFA nomenclature. 계면활성제로 사용되는 알킬기-함유 화합물은 단일 물질일 수 있지만, 식물 또는 동물 기원의 천연 원료의 사용이 이러한 물질의 제조면에서 일반적으로 바람직하며, 그 결과 수득한 이러한 물질의 혼합물은 사용된 특정 출발 물질에 따라 상이한 알킬 사슬 길이를 갖는다. Alkyl group is used as a surface active agent-containing compound can be a single material, and generally preferred from the manufacturing side of this material the use of natural raw materials of vegetable or animal origin, and as a result give a mixture of such materials is the particular starting have different alkyl chain lengths according to the material. 본 발명의 다른 바람직한 구체예는 케라틴-함유 섬유를 화학식(1)의 올리고머성 양이온 염료로 처리하는 방법에 관한 것이다. Other preferred embodiments of the invention are keratin-related to a method for processing a fiber-containing oligomeric cationic dye of formula (1). 상기 방법은 환원제의 존재하에서 모발을 처리하는 것을 포함한다. The method comprises processing the hair in the presence of a reducing agent. 바람직한 환원제는 티오글리콜 산 또는 그의 염, 글리세린 모노티오글리콜레이트, 시스테인, 호모시스테인, 2-머캅토프로피온산, 2-머캅토에틸아민, 티오락트산 및 그의 염, 티오글리세린, 아황산나트륨, 디티오나이트, 아황산 암모늄, 중아황산 나트륨, 메타중아황산 나트륨 또는 히드로퀴논 또는 포스파이트이다. A preferred reducing agent is thioglycolic acid or its salts, glycerine mono thioglycolate, cysteine, homocysteine, 2-mercaptopropionic acid, 2-mercaptoethyl amine, thio lactic acid and salts thereof, thio glycerol, sodium sulphite, dithionite, sulfite ammonium, a sodium bisulfite, sodium sulfite, or metadata of hydroquinone or phosphite. c. c. 염료 분자와 모발 섬유 표면 사이의 SS 결합을 파괴하여 염료 분자가 모발 섬유로부터 분리되게 할 수 있는 환원제를 함유하는 수계 착색물질 제거 조성물과 상기 모발을 접촉시킴으로써 단계 a)에서 도포된 착색물질을 모발로부터 제거하는 것을 포함하는 방법에 관한 것이다. The coloring material is applied in step by contacting the dye molecule and the hair fiber surface SS combined aqueous coloring material removal composition and the hair containing a reducing agent with the dye molecules can be separated from the hair fibers by destroying between a) from hair to a method that includes removing. c. c. 산화제와 처리하는 것을 포함하는 방법에도 관한 것이다. It relates to a method comprising treatment with an oxidizing agent. 상기 반응 단계의 순서는 중요하지 않으며, 환원제는 처음에 또는 마지막 단계에 도포될 수 있다. The order of the reaction steps are not critical, the reducing agent may be applied to the first or the last stage. 모발을 a 2 ) 환원제와 접촉시킨 다음, b 2 ) 상기 화학식(1)의 1 이상의 단일 술피드 염료로 처리하는 것을 포함하는 방법도 포함한다. By contacting the hair with a 2) a reducing agent and then, b 2) also includes a method involving treatment of a single sulfide dye of formula at least one (1). a) 환원제로 처리한 다음, b) 1 이상의 화학식(1)의 염료로 처리하고, 또 c) 산화제로 처리하는 것을 포함하는 방법이 바람직하다. a) The method involving treatment with a dye of the treatment with a reducing agent and then, b) one or more compounds of formula (1), and the process in addition c) an oxidizing agent is preferred. a) 1 이상의 화학식(1)의 단일 염료와 접촉시킨 다음, b) 환원제와 접촉시키고, 또 c) 이어 산화제와 접촉시키는 것을 포함한다. a) is brought into contact with a single dye of at least one formula (1) is brought into contact with the next, b) a reducing agent, and c) after comprises contacting with the oxidizing agent. 통상, 산화제는 산 또는 염기와 함께 도포된다. Typically, the oxidizing agent is applied together with an acid or a base. 산은 예컨대 구연산, 인산 또는 타르타르산이다. The acid is for example citric acid, phosphoric acid or tartaric acid. 염기는 예컨대 수산화나트륨, 암모니아 또는 모노에탄올아민이다. The base is for example sodium hydroxide, ammonia or monoethanolamine. 화학식(1)의 염료는 모발의 전체적 염색, 즉 모발을 처음으로 염색할 때 적합하며 또 재염색, 또는 모발의 타래 또는 일부를 염색할 때에도 적합하다. Dye of formula (1) is suitable when the first dye as the overall staining, that the hair of the hair, and it is also appropriate even when the skein dyeing or part of the re-dyeing, or hair. 화학식(1)의 염료는 손, 빗, 브러시 또는 병, 또는 빗이나 노즐을 구비한 병으로 맛사지하여 모발에 도포된다. Dye of formula (1) is to massage the hand, a comb, a brush, or a bottle, or a bottle provided with a comb or a nozzle is applied to the hair. 본 발명에 따른 염색 방법에서, 염색을 다른 염료 존재하에서 실시하는지 여부는 원하는 칼러 색조에 따라 달라진다. Whether in the dyeing process according to the invention, carried out under different dyeing dye present depends on the desired color tone. 케라틴 함유 섬유를 1 이상의 화학식(1)의 염료, 염기 및 산화제로 처리하는 것을 포함하는 케라틴 함유 섬유의 염색방법도 또한 바람직하다. Dyeing method of keratin-containing fibers, which comprises processing the keratin-containing fiber with a dye, a base and an oxidizing agent in at least one formula (1) are also preferred. 산화 염색 방법은 염기성 pH에서, 케라틴 함유 섬유에 염기 및 과산화수소 수용액의 혼합물을 도포하고, 도포된 혼합물을 모발 상에 방치한 다음 모발을 씻어내는 것을 포함하는 라이트닝(ligntening)을 포함한다. The oxidation dyeing method includes the lightning (ligntening) which comprises applying a mixture of a base and an aqueous hydrogen peroxide solution at a basic pH, the keratin-containing fibers, left for the coating mixture onto the hair, and then rinsing the hair. 이것은 모발 염색시 멜라닌을 라이트닝시키고 모발이 염색되게 한다. This makes the lightning when the hair dye melanin and hair dye. 멜라닌의 라이트닝은 백발(grey hair)의 경우에 균일한 염색을 가능하게 하고 또 천연 착색된 모발의 경우에 색의 발현, 즉 보다 더 보기 좋게 하는 효과를 갖는다. Lightening the melanin has the effect to improve gray hair (hair grey) For a color expression in the case of dyeing, and also enables a uniform natural coloration to the hair, that is more than a. 일반적으로, 산화제 함유 조성물은 30∼200 g의 양으로 15∼45℃ 에서 섬유 상에 0∼15분, 특히 0∼5분간 방치된다. In general, the oxidizing agent containing composition is left for 0-15 minutes on a fiber in an amount of 30~200 15~45 ℃ g, especially 0-5 minutes. 산화제는 예컨대 퍼술페이트 또는 묽은 과산화수소 용액, 과산화수소 유제 또는 과산화수소 젤, 알칼리 토금속 퍼옥사이드, 유기 퍼옥사이드, 예컨대 우레아 퍼옥사이드, 멜라민 퍼옥사이드이며, 또는 반-퍼머, 직접 모발 염료를 기본으로 한 색조 분말이 사용된 경우 알칼리 금속 브로메이트 고정액도 사용될 수 있다. The oxidant, for example persulfate or dilute hydrogen peroxide solutions, hydrogen peroxide emulsions or hydrogen peroxide gels, and alkaline earth metal peroxides, organic peroxides, such as urea peroxides, melamine peroxides, or semi-a permanent, direct hue powder the hair dye base when using an alkali metal bromate fixing solution it may also be used. - DE-A-19 713 698호, 특히 4페이지, 52∼55행 및 60∼61행 또는 EP-A-1 062 940호, 특히 6페이지, 41∼47행 (및 상응하는 WO 99/40895호)에 기재된 바와 같은 퍼머-웨이브 고정액 형태의 산화제. - DE-A-19 713 698 Ho, especially page 4, lines 52-55 and lines 60-61 or EP-A-1 062 940 Ho, especially page 6, lines 41-47 (and the corresponding WO 99/40895 on which the wave fixing solution of the oxidizing agent form -) permanent as described. 가장 바람직한 산화제는 상응하는 조성물의 약 2∼30 중량%, 보다 바람직하게는 약 3∼20 중량%, 가장 바람직하게는 6∼12 중량% 농도로 사용되는 과산화수소이다. The most preferred oxidizing agent is from about 2 to 30% by weight, more preferably from about 3 to 20% by weight of the corresponding composition, and most preferably hydrogen peroxide is used as a 6-12% concentration by weight. 산화제는 본 발명에 따른 염색 조성물에서 전체 염색 조성물을 기준하여 약 0.01%∼6%, 특히 0.01%∼1% 양으로 존재할 수 있다. The oxidant may be present in about 0.01% ~6%, based on the total dyeing composition, in particular 0.01% ~1% dye amount in the composition according to the invention. R 3 , R 4 , R 5 R 3, R 4, R 5 및 R 6 은 서로 독립적으로 수소, C 1 -C 4 알킬 또는 히드록시-(C 1 -C 4 )알킬이다. A (C 1 -C 4) alkyl-, and R 6 independently represent hydrogen, C 1 -C 4 alkyl or hydroxy. 산화제 함유 조성물의 pH값은 약 2∼7, 특히 약 2∼5 이다. pH value of the oxidizing agent containing composition is from about 2 to 7, especially about 2 to 5. 화학식(1)의 염료를 포함하는 배합물을 케라틴-함유 섬유, 바람직하게는 모발에 도포하는 한 바람직한 방법은 WO 97/20545호 p. The formulation containing the dye of formula (1), the keratin-containing fiber in a preferred method of coating, preferably hair No. WO 97/20545 p. 4, 19~27행에 기재된 바와 같은 다구획 염색 장치 또는 키트 또는 다른 다구획 팩키지 시스템을 이용하는 것이다. 4, and as it described in lines 19-27 to use the compartment dyeing device or kit or any other multi-compartment package system. 제1 구획은 예컨대 화학식(1)의 1 이상의 염료 및 경우에 따라 직접 염료 및 염기화제를 포함하고, 또 제2 구획에는 산화제를 포함하거나; The first portion is, for example, and comprises a dye and a base agent directly in accordance with one or more dyes and, if of the formula (1), and a second compartment contains an oxidizing agent, or; 제1 구획에는 화학식(1)의 1 이상의 염료 및 경우에 따라 직접 염료를 포함하고 제2 구획에는 염기화제를 포함하며 또 제3 구획에는 산화제를 포함한다. A first compartment comprising a base, the agent comprises a dye directly in accordance with one or more dyes, and if the second portion of Formula (1) In the third compartment contains an oxidizing agent. 일반적으로 모발은 염색 용액 및/또는 퍼머-웨이브 용액으로 처리한 후 린스된다. In general hair dyeing solution and / or permanent-wave solution is rinsed after treatment with. b. b. 케라틴-함유 섬유를 단계a에서 제조된 혼합물과 접촉시키는 단계. Keratin-containing fibers comprising: a manufacturing step in a mixture with the contact. 무 산화제 조성물의 pH-값은 통상 3∼11, 특히 5∼10, 가장 바람직하게는 약 9∼10이다. pH- value of the oxidizing agent free composition is usually 3-11, particularly 5-10, most preferably from about 9-10. 바람직하게는, 즉시 사용 가능한 조성물은 한편으로는 특히 파라-페닐렌디아민 및 비스(페틸)-알킬렌디아민, 그의 산 부가염으로부터 선택된 적어도 하나의 현색제 화합물; Preferably, the ready-to-use composition is the one hand in particular para-phenylenediamine and bis (petil) alkylenediamines, at least one developer compound selected from the acid addition salt; 특히 메타-페닐렌디아민 및 그의 산 부가염으로부터 선택된 적어도 하나의 커플러; In particular, meta-phenylene diamine and at least one coupler selected from the acid addition salt; 및 화학식(1)의 적어도 하나의 염료를 포함하는 조성물(A), 다른 한편으로는 염색에 적합한 매질에서 적어도 하나의 산화제를 함유하는 조성물(B)를 별도로 저장하고, 그리고 이 혼합물을 케라틴-함유 섬유에 도포하기 직전에 조성물(A) 및 (B)를 함께 혼합하는 예비 단계를 포함하는 공정에 의해 제1 바람직한 구체예에 따라 제조된다. And a composition (A), on the other hand stores a composition (B) containing at least one oxidizing agent in a suitable medium for dyeing otherwise, and the mixture keratin comprising at least one dye of formula (1) contains by the step of immediately prior to application to the fibers comprising a preliminary step of mixing the composition (a) and (B) are produced together in accordance with a first preferred embodiment. 즉시 사용 가능한 염료 조성물의 제조에 바람직한 제2 구체예에 따른 방법은, 한편으로는 특히 파라-페닐렌디아민 및 비스(페틸)-알킬렌디아민, 그의 산 부가염으로부터 선택된 적어도 하나의 현색제 화합물; Ready-to-use method according to the second embodiment preferable for the preparation of dye compositions, on the other hand, in particular para-phenylenediamine and bis (petil) alkylenediamines, at least one developer compound selected from the acid addition salt; 특히 메타-페닐렌디아민 및 그의 산 부가염으로부터 선택된 적어도 하나의 커플러 화합물을 포함하는 조성물(A), 다른 한편으로는 염색에 적합한 매질에서 적어도 하나의 화학식(1)의 염료를 포함하는 조성물(A'), 및 마지막으로 염색에 적합한 매질에서 상술한 산화제를 적어도 하나 함유하는 조성물(B)를 별도로 저장하고, 그리고 사용 시 이 혼합물을 케라틴-함유 섬유에 도포하기 직전에 함께 혼합하는 예비 단계를 포함한다. In particular, meta-phenylene diamine and a composition comprising at least one coupler compound selected from the acid addition salt (A), on the other hand a composition comprising at least one dye of formula (1) in a medium appropriate for dyeing (A include a preliminary step of mixing together just prior to application of the contained fiber - '), and finally storing the above-mentioned oxidizing agent in a medium appropriate for dyeing, at least one containing composition (B) separately and, and when using a mixture keratin do. 제2 구체예에 따라 사용되는 조성물(A')는 경우에 따라 분말 형태일 수 있고, 화학식(1)의 염료(자체)는 상기 경우에서 조성물(A')의 전체를 구성하거나 또는 경우에 따라 유기 및/또는 무기 분말 부형제에 분산될 수 있다. The composition for use according to the second embodiment (A ') may be in the powder form as the case may be, formula (1) dye (itself) is the composition (A in the case of a "depending on the configuration the whole), or when It may be dispersed in an organic and / or inorganic powder excipient. 조성물(A')에 존재하는 경우, 유기 부형제는 합성 또는 천연물일 수 있고 또 가교된 및 비가교된 합성 중합체, 셀룰로오스 및 변형된 또는 비변형된 전분과 같은 다당류 뿐만 아니라 톱밥 및 식물 검(구아 검, 카로브 검, 크산탄 검 등)과 같은 천연 생성물로부터 선택된다. When present in the composition (A '), the organic vehicle is a synthetic or can be a natural product, and also cross-linked and non-crosslinked with a synthetic polymer, cellulose and polysaccharides, such as modified or unmodified starches, as well as sawdust and plant gums (guar gum , carob gum, and is selected from natural products such as xanthan gum, etc.). 조성물(A')에 존재하는 경우, 무기 부형제는 산화티탄, 산화알루미늄, 카올린, 활석, 실리케이트, 운모 및 실리카와 같은 금속 산화물을 함유할 수 있다. When present in the composition (A '), the inorganic excipient may contain metal oxides such as titanium oxide, aluminum oxide, kaolin, talc, silicates, mica and silica. 본 발명에 따른 염색 조성물에서 매우 적합한 부형제는 톱밥이다. Very suitable excipient in the dyeing compositions according to the invention is sawdust. 분말형 조성물(A')는 결합제 또는 코팅 생성물을 조성물(A')의 전체 중량을 기준하여 약 3중량%를 초과하지 않는 양으로 함유할 수 있다. Powdered composition (A ') is a binder or coating product composition (A' can be contained in an amount that does not exceed about 3% by weight, based on the total weight of a). 이들 결합제는 바람직하게는 무기, 합성, 동물 또는 식물성 오일 및 액체 지방 물질로부터 선택된다. The binder is selected from a preferably inorganic, synthetic, animal or vegetable oils and liquid fatty substances. 또한 본 발명은 자가 산화성 화합물을 갖는 화학식(1)의 염료 및 경우에 따라 추가의 염료를 사용하여 케라틴 함유 섬유를 염색하는 방법에 관한 것이다. The invention also relates to a method of dyeing a keratin-containing fiber with the addition of a dye according to the formula (I) dye and the case of having a self-oxidative compounds. b. b. pH를 경우에 따라 다른 염료 및 경우에 따라 화학식(1)의 염료 1 이상의 존재하에 산으로 처리함으로써 6∼2로 조정하는 것을 포함하며, 단 단계 a. By treatment with an acid in the presence at least one dye of formula (1) in accordance with another dye, and if according to the case, and the pH adjusted to 6-2 comprises, with the proviso that step a. 또는 b.의 적어도 하나에서 화학식(1)의 1 이상의 염료가 존재하는, 케라틴-함유 섬유를 화학식(1)의 염료 및 캡핑된 디아조화 화합물로 염색하는 방법에 관한 것이다. Or b of the present, the keratin or more dyes of formula (1) in at least one - relates to a process for dyeing a fiber comprising a dye and a capped diazotized compound of formula (1). 캡핑된 디아조화 화합물 및 커플러 화합물 및 경우에 따라 산화제 및 현색제 화합물은 임의 순서로 연속적으로 또는 동시에 도포될 수 있다. According to the capped diazotized compound and a coupler compound, and when the oxidizing agent and developer compound can be applied successively or simultaneously in any order. 바람직하게는 캡핑된 디아조화 화합물 및 커플러 화합물을 동시에 단일 조성물로 하여 도포한다. Preferably applied to the capped diazotized compound and a coupler compound at the same time in a single composition. 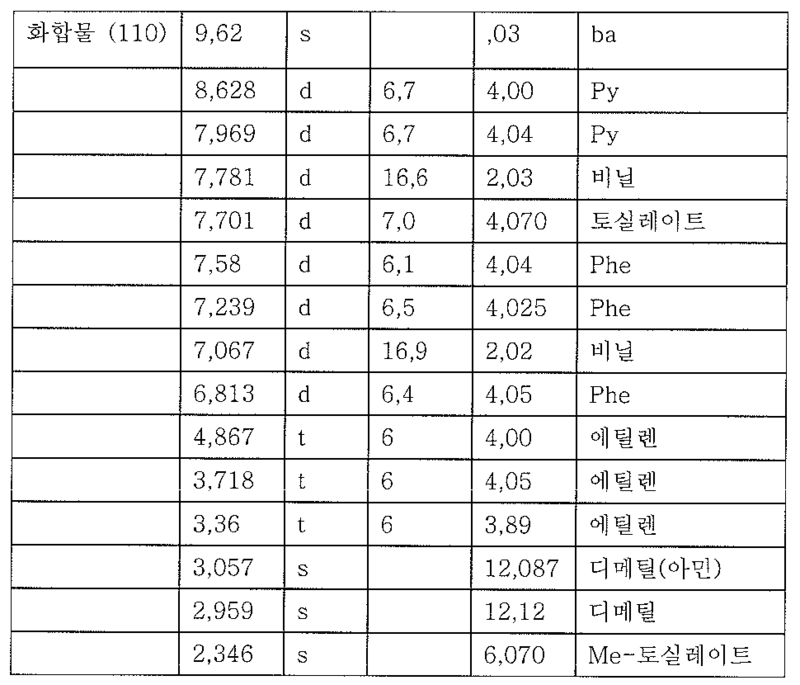 "알칼리성 조건"이란 pH가 8∼10, 바람직하게는 9∼10, 특히 9.5∼10인 것을 의미하며, 이는 염기, 예컨대 탄산나트륨, 암모니아 또는 수산화나트륨을 부가함으로써 달성한다. It means "alkaline conditions" is means a pH of 8-10, preferably 9-10, in particular 9.5 to 10, which is achieved by adding a base, such as sodium carbonate, ammonia or sodium hydroxide. 염기는 모발, 염기 전구체, 캡핑된 디아조화 화합물 및/또는 수용성 커플링 성분에 부가하거나 또는 염료 전구체를 포함하는 염색 조성물에 부가한다. The base is added to the dye composition comprising a hair and a base precursor, addition or dye precursor in the capped diazotized compound and / or a water-soluble coupling component. 산은 예컨대 타르타르산 또는 구연산, 구연산 겔, 경우에 따라 산 염료와의 적당한 완충용액이다. The acid, for example an appropriate buffer solution and the acid dye in accordance with tartaric acid or citric acid, citric acid gel, a case. 제1 단계에서 도포된 알칼리성 염색 조성물의 양 대 제2 단계에서 도포된 산 염색 조성물의 양의 비는 바람직하게는 약 1:3 내지 3:1, 특히 약 1:1이다. The amount of acid dyeing composition applied in the ratio of the amount for the second stage of alkaline dyeing composition applied in step 1 is preferably from about 1: 1: 3 to 3: 1, especially about 1. 또한 본 발명은 케라틴 함유 섬유를 화학식(1)의 염료 및 적어도 하나의 산 염료로 염색하는 방법에 관한 것이다. The invention also relates to a method of dyeing a keratin-containing fiber with a dye and at least one acid dye of formula (1). 이하의 실시예는 염색 방법을 예시하며, 이들에 한정되지 않는다. The following examples illustrate the dyeing method, but are not limited to these. 특별히 다 르게 언급하지 않는 한, 부 및 %는 중량 기준이다. Unless properly is particularly, parts and percentages are by weight. 제시된 염료의 양은 착색될 재료에 대한 것이다. The amount of dye is presented to the material to be colored. T, s, d, q 및 J는 MNR 스펙트럼 값을 정의하며, t는 트리플렛, s는 싱글렛, d는 듀플렛, q는 쿼테트, 및 J는 커플링 상수이다. T, s, d, q and J defines the MNR spectrum values, t is triplet, s is singlet, d is the dew flat, q is the query Tet, and J is a coupling constant. 100 ml 클로로포름 중의 2,2-디티오디에탄올 15.4 g과 피리딘 24.1 g의 혼합물을 교반과 동시에 0℃까지 냉각시킨 다음, 염화 토실 41.0 g을 소량씩 부가하고, 외부 냉각에 의해 온도를 0℃로 유지한다. Cooling the mixture of 2,2-dithiane audio 15.4 g ethanol and 24.1 g pyridine in 100 ml of chloroform while stirring to 0 ℃ then added, in small portions 41.0 g of tosyl chloride, and maintaining the temperature at 0 ℃ by external cooling do. 부가 완료 후, 그 혼합물을 냉장고에 철야 방치하여 반응을 완결시킨다. After the addition is completed, to complete the reaction and allowed to stand overnight and the mixture in the refrigerator. 이 반응 혼합물을 물/염산 및 얼음 슬러리와 혼합한 후, 상을 분리하여 물로 세척한 다음 건조한다. After the reaction mixture is mixed with a water / hydrochloric acid and ice slurry, the phases separated and washed with water and dried. 톨루엔술포네이트 디에스테르 용액을 제2 반응 단계에서 출발 화합물로서 사용한다. Use toluenesulfonate diester solution as a starting compound in a second reaction step. 제1 반응 단계에서 얻어진 알킬화제를 용매로부터 분리하고, 2 당량(18.8g)의 4-메틸-피리딘에 용해한다. The separation of the alkylating agent obtained in the first reaction step from the solvent, 4-methyl-2 equivalents (18.8g) - is dissolved in pyridine. 온도를 70℃로 승온하고, 60℃에서 12 시간 동안 유 지한다. Temperature was raised to 70 ℃, and maintained at 60 ℃ for 12 hours. 상기 단계의 반응 혼합물에 이소프로판올 50 ml를 가한 다음, 당량(30.0 g)의 디메틸아미노-벤즈알데히드와 촉매량(3.6g)의 피페리딘을 가한 후, 반응 혼합물을 70℃에서 24시간 동안 교반한다. And stirred was added to piperidin-benzaldehyde and a catalytic amount (3.6g), the reaction mixture at 70 ℃ for 24 hours, - adding a 50 ml of isopropanol to the reaction mixture of step dimethyl the next, equivalent weight (30.0 g) amino. 반응 생성물을 냉각에 의해 침전시킨 후, 여과 분리한 다음, 진공 건조하여 적오렌지색 고체 생성물 45 g을 얻는다. After precipitation of the reaction product by cooling, then separated by filtration, and dried in vacuum to obtain 45 g of an orange solid product ever. 그 생성물을 메탄올로부터 2회 재결정화시킨다. The product was then recrystallized twice from methanol. - HPLC-MS에 의해, 주성분이 질량 568의 이양이온임을 확인한다. - Check that the by HPLC-MS, the main component of the mass transfer of ions 568. 100 ml 클로로포름 중의 2,2-디티오디에탄올 15.4 g과 피리딘 24.1 g의 혼합물을 교반과 동시에 0℃까지 냉각시킨 다음, 염화 메실 22.0 g을 소량씩 부가하고, 외부 냉각에 의해 상기 온도를 유지한다. Cooling the mixture of 2,2-dithiane audio 15.4 g ethanol and 24.1 g pyridine in 100 ml of chloroform while stirring to 0 ℃ then added, in small portions 22.0 g of mesyl chloride, and maintaining the temperature by external cooling. 부가 완료 후, 그 혼합물을 냉장고에서 철야 방치하여 반응을 완결시킨다. After the addition is completed, to complete the reaction and allowed to stand overnight and the mixture in the refrigerator. 이 반응 혼합물을 물/염산 및 얼음 슬러리와 혼합한 후, 상을 분리하여 물로 세척한 다음 건조한다. After the reaction mixture is mixed with a water / hydrochloric acid and ice slurry, the phases separated and washed with water and dried. 메탄술포네이트 디에스테르 용액을 제2 반응 단계에서 출발 화합물로서 사용한다. Use methanesulfonate diester solution as a starting compound in a second reaction step. 2 당량(18.8g)의 4-메틸-피리딘을 용매와 함께 상기 알킬화제에 용해한다. 4-methyl-2 equivalents (18.8g) - pyridine with the solvent is dissolved in the alkylating agent. 온도를 환류까지 승온한 후, 70℃에서 12 시간 동안 유지한다. After the temperature was raised to reflux and held for 12 hours at 70 ℃. 제2 반응 단계에서 얻어진 반응 혼합물에 당량(24.0 g)의 아미노-벤즈알데히드와 촉매량(3.6g)의 피페리딘을 가한 후, 반응 혼합물을 70℃에서 24시간 동안 교 반한다. Runs counter T, and the resulting mixture was added to piperidin-benzaldehyde and a catalytic amount (3.6g) at 70 ℃ for 24 hours - the amino equivalents of (24.0 g) to the reaction mixture obtained in the second reaction step. 반응 생성물을 냉각에 의해 침전시킨 후, 여과 분리한 다음, 진공 건조하여 오렌지색 고체 생성물 42 g을 얻는다. After precipitation of the reaction product by cooling, then separated by filtration, and vacuum-dried to obtain 42 g of an orange solid product. 그 생성물을 메탄올로부터 2회 재결정화시킨다. The product was then recrystallized twice from methanol. - HPLC-MS에 의해, 주성분이 질량 512의 이양이온임을 확인한다. - Check that the by HPLC-MS, the main component of the mass transfer of ions 512. 100 ml 물 중의 디클로로하이드레이트로서 시스테아민 25.4 g의 혼합물을 교반과 동시에 0℃까지 냉각시킨 다음, 브로모아세트산 브롬화물 41.0 g을 소량씩 부가하고, 외부 냉각에 의해 온도를 0℃로 유지한다. After cooling as dichloro-hydrate in 100 ml of water to a mixture of cysteamine 25.4 g at the same time and stirred 0 ℃ then added bromoacetic acid bromide by the cargo 41.0 g amount, and maintaining the temperature at 0 ℃ by external cooling. 수산화나트륨으로 pH를 8.0으로 조절한다. Adjust the pH to 8.0 with sodium hydroxide. 부가 완료 후, 그 혼합물을 교반과 동시에 1 시간 동안 방치하여 반응을 완결시킨다. After complete addition, the mixture to complete the reaction allowed to stand for one hour while stirring. 이 반응 혼합물을 여과 분리하고, 고체를 물로 세척한 다음 건조한다. Separating the reaction mixture was filtered, washing the solid with water and then dried. 알킬화제를 제2 반응 단계에서 출발 화합물로서 사용한다. The alkylating agent used as starting compound in the second reaction step. 제1 단계에서 얻어진 알킬화제를 50 ml의 이소프로판올에 가한 후, 2 당량(18.8g)의 4-메틸-피리딘에 용해한다. After adding the alkylating agent obtained in the first step in 50 ml of isopropanol, 4-methyl-2 equivalents (18.8g) - is dissolved in pyridine. 온도를 80℃까지 승온한 후, 10 시간 동안 유지한다. After the temperature was raised to 80 ℃, maintained for 10 hours. 제2 반응 단계에서 얻어진 반응 혼합물에 20 ml의 이소프로판올을 첨가한 다음, 디메틸아미노 벤즈알데히드의 당량(30.0 g)과 촉매량(3.6g)의 피페리딘을 가한 후, 반응 혼합물을 80℃에서 24시간 동안 교반한다. First, and the resulting mixture was added to piperidin-2 was added to 20 ml of isopropanol to the reaction mixture obtained in the reaction step, and then, the equivalent amount of dimethylamino-benzaldehyde (30.0 g) and a catalytic amount (3.6g) at 80 ℃ for 24 hours and stirred. 반응 생성물을 냉각에 의해 침전시킨 후, 여과 분리한 다음, 진공 건조하여 오렌지색 고체 생성물 59 g을 얻는다. After precipitation of the reaction product by cooling, then separated by filtration, and dried in vacuum to obtain 59 g of an orange solid product. 그 생성물을 이소프로판올로부터 2회 재결정화시킨다. The product was then recrystallized twice from isopropanol. - HPLC-MS에 의해, 주성분이 질량 682의 이양이온임을 확인한다. - Check that the by HPLC-MS, the main component of the mass transfer of ions 682. 100 ml 클로로포름 중의 2,2-디티오디프로피온산 21.4 g과 염화티오닐 24.0g의 혼합물을 소량씩 첨가하면서 외부 냉각에 의해 온도를 유지한다. It was added a mixture of 2,2-dithiane audio 21.4 g propionic acid and 24.0g of thionyl chloride in 100 ml chloroform in small portions to keep the temperature by external cooling. 부가 완료 후, 혼합물을 가열하여 생성된 가스를 제거하여 반응을 완결한다. After complete addition, by removing the gas produced by heating the mixture to complete the reaction. 용매를 저압 하에서 증류에 의해 제거하고 산 염화물을 제2 반응 단계에서 출발 화합물로서 사용한다. Use of the solvent removed by distillation under low pressure and the acid chloride as a starting compound in a second reaction step. 알킬화제로서 디메틸술페이트를 용매 없이 사용하고, 2 당량(18.8g)의 2-메틸-피리딘과 혼합한다. Using dimethyl sulfate as alkylating agent in the absence of a solvent, and 2-methyl-2 equivalents (18.8g) - is mixed with pyridine. 온도를 80℃까지 승온시키고 2 시간 동안 유지한다. Temperature was raised to 80 ℃ and maintained for 2 hours. 이소프로판올 50 ml를 상기 단계의 반응 혼합물에 부가한다. It is added to 50 ml of isopropanol to the reaction mixture of step. 아미노벤즈알데히드의 당량(24.0g)과 촉매량(3.6g)의 피페리딘을 가한 후, 반응 혼합물을 70℃에서 16시간 동안 교반한다. Was added to the piperidine of the equivalent amount of amino-benzaldehyde (24.0g) and a catalytic amount (3.6g), the reaction mixture is stirred at 70 ℃ for 16 hours. 반응 생성물을 냉각에 의해 침전시킨 후, 여과 분리한 다음, 진공 건조하여 오렌지색 고체 생성물 49 g을 얻는다. After precipitation of the reaction product by cooling, then separated by filtration, and vacuum-dried to obtain 49 g of an orange solid product. 그 생성물을 물로부터 2회 재결정화시킨다. The product was then recrystallized twice from water. 제3 반응 단계에서 얻어진 스티렌 화합물 49g과 물 200 ml의 혼합물을 교반과 동시에 0℃까지 냉각한 다음, 테트라하이드로푸란에 용해된 반응단계 1에서 얻어진 산 염화물 41.0g을 소량씩 첨가하고, 이 온도를 외부 냉각에 의해 유지한다. A third cooling the styrene compound 49g as a mixture of 200 ml of water obtained in the reaction step and at the same time stirred to 0 ℃ added, by 41.0g of the acid chloride obtained in reaction step 1 dissolved in a small amount of tetrahydrofuran, and the temperature It is held by the external cooling. 수산화 나트륨을 첨가하여 pH를 6.0까지 조절한다. Adjust the pH to 6.0 by addition of sodium hydroxide. 첨가 종료 후, 혼합물을 교반과 동시에 1 시간 동안 방치하여 반응을 완결한다. After the addition was completed, the mixture was stirred at the same time and allowed to stand for 1 hour to complete the reaction. 반응 혼합물을 여과 분리한 다음, 고체를 물로 세척한 후 건조한다. By filtration and the reaction mixture is then dried and then the solid washed with water. 생성물을 이를테면 염색 분야에 사용될 수 있다. The product can be used for instance in the field of dyeing. 디클로로하이드레이트로서 2,2-디티오디에틸아민(시스테아민) 25.4g과 물 100 ml의 혼합물을 교반과 동시에 0℃까지 냉각한 다음, 브로모아세트산 브롬화물 41.0 g을 소량씩 부가하고, 외부 냉각에 의해 상기 온도를 유지한다. Dichloro-2,2-dithiol as a hydrate audio ethylamine (cysteamine) 25.4g and cooling the mixture of 100 ml of water while stirring to 0 ℃ and then bromo acetic acid bromide by adding all the small amount of 41.0 g, and the outer cooling and by maintaining the temperature. 수산화나트륨을 첨가하여 pH를 8.0으로 조절한다. Adjust the pH to 8.0 by addition of sodium hydroxide. 부가 완료 후, 그 혼합물을 교반과 동시에 1 시간 동안 방치하여 반응을 완결시킨다. After complete addition, the mixture to complete the reaction allowed to stand for one hour while stirring. 제1 반응 단계에서 얻어진 알킬화제를 용매로부터 분리하고, 2 당량(18.8g)의 2-메틸-피리딘에 용해한다. The separation of the alkylating agent obtained in the first reaction step from the solvent, 2-methyl-2 equivalents (18.8g) - is dissolved in pyridine. 온도를 80℃까지 승온한 후, 16 시간 동안 60℃로 유지한다. After the temperature was raised to 80 ℃, and kept at 60 ℃ for 16 hours. 제2 반응 단계에서 얻어진 반응 혼합물에 50 ml의 이소프로판올을 첨가한다. Claim is added to 50 ml of isopropanol to the reaction mixture obtained in the second reaction step. 디메틸아미노 벤즈알데히드의 당량(30.0 g)과 촉매량(3.6g)의 피페리딘을 가한 후, 반응 혼합물을 70℃에서 24시간 동안 교반한다. After adding the equivalent amount of piperidine in dimethyl amino benzaldehyde (30.0 g) and a catalytic amount (3.6g), the reaction mixture is stirred at 70 ℃ for 24 hours. 반응 생성물을 냉각에 의해 침전시킨 후, 여과 분리한 다음, 진공 건조하여 오렌지색 고체 생성물 57 g을 얻는다. After precipitation of the reaction product by cooling, then separated by filtration, and vacuum-dried to obtain 57 g of an orange solid product. 그 생성물을 메탄올로부터 2회 재결정화시킨다. The product was then recrystallized twice from methanol. 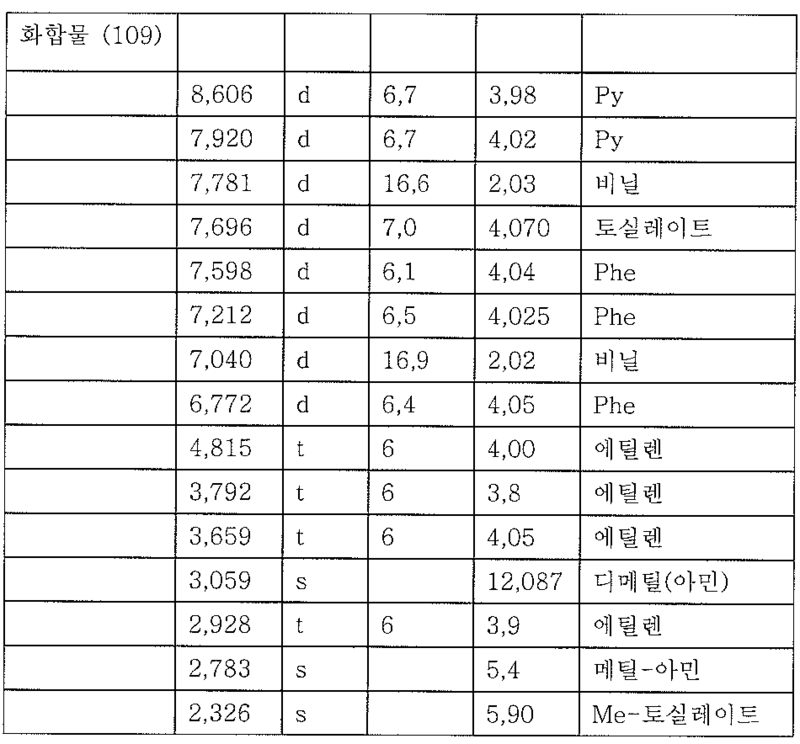 염화티오닐 24.0g을 100 ml 클로로포름 중의 2,2-디티오디프로피온산 21.4 g의 혼합물에 소량씩 첨가하면서 외부 냉각에 의해 온도를 유지한다. Was added in small portions to a mixture of 100 ml chloroform and 24.0g of thionyl chloride, 2,2-dithio acid 21.4 g of the audio and maintaining the temperature by external cooling. 부가 완료 후, 혼합물을 가열하여 생성된 가스를 제거하여 1 시간 내에 반응을 완결한다. After the addition is completed, remove the gas produced by heating the mixture to complete the reaction within 1 hour. 용매를 저압 하에서 증류에 의해 제거하고 산 염화물을 제2 반응 단계에서 출발 화합물로서 사용한다. Use of the solvent removed by distillation under low pressure and the acid chloride as a starting compound in a second reaction step. 알킬화제로서 디메틸술페이트를 용매 없이 사용하고, 2 당량(18.8g)의 4-메틸-피리딘과 혼합한다. Using dimethyl sulfate as alkylating agent in the absence of a solvent, and 4-methyl-2 equivalents (18.8g) - is mixed with pyridine. 온도를 80℃까지 승온시키고 2 시간 동안 80℃에서 유지한다. Temperature was raised to 80 ℃ was maintained at 80 ℃ for 2 hours. 이소프로판올 50 ml를 제2 반응 단계에서 얻어진 반응 혼합물에 첨가한다. It is added to 50 ml of isopropanol to the reaction mixture obtained in the second reaction step. 그 다음, 아미노벤즈알데히드의 당량(24.0g)과 촉매량(3.6g)의 피페리딘을 가한 후, 반응 혼합물을 70℃에서 12시간 동안 교반한다. Then, the mixture was stirred for 12 hours after adding the piperidine of the amino equivalents of benzaldehyde (24.0g) and a catalytic amount (3.6g), the reaction mixture was 70 ℃. 반응 생성물을 냉각에 의해 침전시킨 후, 여과 분리한 다음, 진공 건조하여 오렌지색 고체 생성물 55 g을 얻는다. After precipitation of the reaction product by cooling, then separated by filtration, and vacuum-dried to obtain 55 g of an orange solid product. 그 생성물을 물로부터 2회 재결정화시킨다. The product was then recrystallized twice from water. 제3 반응 단계에서 얻어진 스티렌 화합물 55g과 물 200 ml의 혼합물을 교반과 동시에 0℃까지 냉각한 다음, 테트라하이드로푸란에 용해된 제1 반응 단계에서 얻어진 산 염화물 45.0g을 소량씩 첨가하고, 온도를 외부 냉각에 의해 0℃로 유지한다. A third cooling the styrene compound 55g as a mixture of 200 ml of water obtained in the reaction step and at the same time stirred to 0 ℃ these, tetrahydrofuran is added in the first of the acid chloride 45.0g obtained in the first reaction step a small amount, temperature and dissolved in and it kept at 0 ℃ by external cooling. 수산화 나트륨을 첨가하여 pH를 7.0까지 조절한다. Adjust the pH to 7.0 by addition of sodium hydroxide. 100 ml 클로로포름 중의 2,2-디티오글리콜산 18.4 g과 염화티오닐 24.0g의 혼합물을 소량씩 첨가하면서 외부 냉각에 의해 상기 온도를 유지한다. While adding 18.4 g of 2,2-dithio glycolic acid and a mixture of 24.0g of thionyl chloride in 100 ml chloroform in small portions to keep the temperature by external cooling. 부가 완료 후, 혼합물을 가열하여 생성된 가스를 제거하고 1 시간 내에 반응을 완결한다. After the addition is completed, remove the gas generated by heating the mixture to complete the reaction within 1 hour. 용매를 저압 하에서 증류에 의해 제거하고 산 염화물을 제4 반응 단계에서 사용한다. Use of the solvent removed by distillation under low pressure and the acid chloride in a fourth reaction step. 알킬화제로서 디메틸술페이트를 용매 없이 2 당량(18.8g)의 4-메틸-피리딘과 함께 사용한다. Of dimethylsulfide two equivalents (18.8g) of sulfate in the absence of a solvent as the alkylating agent 4-methyl-pyridine is used with. 온도를 70℃까지 승온시키고 2 시간 동안 80℃에서 유지한다. Raising the temperature to 70 ℃ was maintained at 80 ℃ for 2 hours. 이소프로판올 50 ml를 제2 반응 단계에서 얻어진 반응 혼합물에 첨가한다. It is added to 50 ml of isopropanol to the reaction mixture obtained in the second reaction step. 그 다음, 아미노-벤즈알데히드의 당량(24.0g)과 촉매량(3.6g)의 피페리딘을 가한 후, 반응 혼합물을 70℃에서 24시간 동안 교반한다. Then, the amino-stirred after adding the equivalent amount of piperidine (24.0g) and a catalytic amount (3.6g) of benzaldehyde and the reaction mixture at 70 ℃ for 24 hours. 제3 반응 단계에서 얻어진 스티렌 화합물 49g과 물 200 ml의 혼합물을 교반과 동시에 0℃까지 냉각한 다음, 테트라하이드로푸란 30 ml로 희석되고 제1 반응 단계에서 얻어진 산 염화물 35.0g을 소량씩 첨가하고, 온도를 외부 냉각에 의해 0℃로 유지한다. A third cooling the styrene compound 49g as a mixture of 200 ml of water obtained in the reaction step and at the same time stirred to 0 ℃ then diluted with 30 ml of tetrahydrofuran was added little by little to the acid chloride 35.0g obtained in the first reaction step, and kept at 0 ℃ temperature by the outside cooling. 수산화 나트륨을 첨가하여 pH를 6.0까지 조절한다. Adjust the pH to 6.0 by addition of sodium hydroxide. 100 ml 클로로포름 중의 2,2-디티오글리콜산 18.4 g과 염화티오닐 24.0g의 혼합물을 소량씩 첨가하면서 외부 냉각에 의해 온도를 20℃로 유지한다. While adding 18.4 g of 2,2-dithio glycolic acid and a mixture of 24.0g of thionyl chloride in 100 ml chloroform in small portions to keep the temperature at 20 ℃ by external cooling. 부가 완료 후, 혼합물을 가열하여 생성된 가스를 제거하고 반응을 완결한다. After the addition is completed, remove the gas generated by heating the mixture to complete the reaction. 용매를 저압 하 에서 증류에 의해 제거하고 산 염화물을 다음 단계에서 사용한다. Removal by distillation of the solvent at low pressure and the acid chloride and used in the next step. 알킬화제로서 디메틸술페이트를 용매 없이 사용하고 2 당량(18.8g)의 2-메틸피리딘에 용해한다. Using dimethyl sulfate as alkylating agent in the absence of a solvent and dissolved in two equivalents of 2-methyl-pyridine (18.8g). 온도를 70℃까지 승온시키고 2 시간 동안 80℃에서 유지한다. Raising the temperature to 70 ℃ was maintained at 80 ℃ for 2 hours. 이소프로판올 50 ml를 제2 반응 단계에서 얻어진 반응 혼합물에 첨가한다. It is added to 50 ml of isopropanol to the reaction mixture obtained in the second reaction step. 아미노-벤즈알데히드의 당량(24.0g)와 촉매량(3.6g)의 피페리딘을 가한 후, 반응 혼합물을 70℃에서 24시간 동안 교반한다. Amino- and stirred for 24 hours after adding the equivalent amount of piperidine (24.0g) and a catalytic amount (3.6g) of benzaldehyde and the reaction mixture was 70 ℃. 반응 생성물을 냉각에 의해 침전시킨 후, 여과 분리한 다음, 진공 건조하여 오렌지색 고체 생성물 49 g을 얻는다. After precipitation of the reaction product by cooling, then separated by filtration, and vacuum-dried to obtain 49 g of an orange solid product. 그 생성물을 이소프로판올로부터 2회 재결정화시킨다. The product was then recrystallized twice from isopropanol. 제3 반응 단계에서 얻어진 스티렌 화합물 49g과 물 200 ml의 혼합물을 교반과 동시에 0℃까지 냉각한 다음, 제1 반응 단계에서 얻어진 산 염화물 41.0g을 소량씩 첨가하고, 온도를 외부 냉각에 의해 0℃로 유지한다. A third cooling the styrene compound 49g as a mixture of 200 ml of water obtained in the reaction step and at the same time stirred to 0 ℃, and then, the temperature by the addition of 41.0g each of the acid chloride obtained in the first reaction step a small amount, and the external cooling 0 ℃ It should remain. 수산화 나트륨을 첨가하여 pH를 6.0까지 조절한다. Adjust the pH to 6.0 by addition of sodium hydroxide. 첨가 종료 후, 혼합물을 교반과 동시에 1 시간 동안 방치하여 반응을 완결한다. After the addition was completed, the mixture was stirred at the same time and allowed to stand for 1 hour to complete the reaction. 반응 혼합물을 여과 분리한 다음, 고체를 물로 세척한 후 건조한다. By filtration and the reaction mixture is then dried and then the solid washed with water. 생성물을 염색 분야에 사용될 수 있다. The product can be used in the dyeing sector. 2-히드록시에틸-메틸아민 21.5g의 혼합물을 염산으로 중화시킨 다음 건조 증발시킨다. 2-hydroxyethyl-neutralization of a mixture of 21.5g of methylamine with hydrochloric acid then dried and evaporated. 염을 클로로포름에 현탁하고 교반 하에서 0℃까지 냉각한 다음, 염화 티오닐 41.0g을 소량씩 첨가하고 온도를 외부 냉각에 의해 0℃로 유지한다. The salt was suspended in chloroform and cooled under stirring to 0 ℃ then added little by little, and 41.0g of thionyl chloride keeping the temperature at 0 ℃ by external cooling. 부가 완료 후, 환류까지 가열하고 혼합물을 탈기함으로써 반응을 종료한다. After complete addition, heating to reflux and the reaction is terminated by stripping the mixture. 용액을 증발 건조하고, 2-클로로에틸-메틸아민을 제2 반응 단계에서 클로로 하이드레이트로서 사용한다. Drying and evaporation of the solution, 2-chloroethyl-methylamine is used as chlorohydrate in the second reaction step. 제1 반응 단계에서 얻어진 알킬화제를 n-부탄올에 용해하고 4-메틸-피리딘 2당량(16.8g)을 첨가한다. Dissolving the alkylating agent obtained in the first reaction step in n- butanol and 4-methyl-pyridine is added two equivalents (16.8g). 온도를 120℃까지 승온한 후, 6 시간 동안 유지한다. After the temperature was raised to 120 ℃, and maintained for 6 hours. 그 다음 온도를 70℃까지 낮춘다. Lower the temperature to the next 70 ℃. 디메틸아미노벤즈알데히드의 당량(30.0 g)과 촉매량(3.6g)의 피페리딘을 제2 반응 단계에서 얻어진 반응 혼합물에 첨가한 다음, 그 반응 혼합물을 70℃에서 24시간 동안 교반한다. Was added piperidine equivalent of dimethylamino benzaldehyde (30.0 g) and a catalytic amount (3.6g) to the reaction mixture obtained in the second reaction step, followed by stirring for 24 hours the reaction mixture at 70 ℃. 반응 생성물을 냉각에 의해 침전시킨 후, 여과 분리한 다음, 진공 건조하여 오렌지색 고체 생성물 50 g을 얻는다. After precipitation of the reaction product by cooling, then separated by filtration, and vacuum-dried to obtain 50 g of an orange solid product. 100 ml 클로로포름 중의 2,2-디티오디에탄올 15.4g과 피리딘 24.1g의 혼합물을 교반과 동시에 0℃까지 냉각한 다음, 염화메실 22.0 g을 소량씩 첨가하고, 외부 냉각에 의해 온도를 0℃로 유지한다. Cooling the 2,2-dithiol audio ethanol mixture of 15.4g and 24.1g pyridine in 100 ml of chloroform while stirring to 0 ℃ added, in small portions 22.0 g of mesyl chloride, maintaining the temperature at 0 ℃ by external cooling do. 부가 완료 후, 그 혼합물을 냉장고에서 철야 방치하여 반응을 완결시킨다. After the addition is completed, to complete the reaction and allowed to stand overnight and the mixture in the refrigerator. 이 반응 혼합물을 물/염산 및 얼음 슬러리와 혼합한 후, 상 분리를 한 후 물로 세척한 다음 건조한다. After the reaction mixture is mixed with a water / hydrochloric acid and ice slurry, was washed and then the phase separation with water and dried. 메탄술포네이트 디에스테르의 용액을 제5 반응 단계에서 사용한다. And a solution of methanesulfonate diester in the fifth reaction stage. 제3 반응 단계에서 얻어진 중간체 염료 분자 2 당량(18.8g)을 제4 반응 단계에서 얻어진 알킬화제에 용매와 함께 용해한다. First dissolved with a solvent, the intermediate dye molecule two equivalents (18.8g) obtained in the third reaction stage the alkylating agent obtained in the fourth reaction step. 온도를 환류까지 상승시키고 12 시간 동안 70℃로 유지한다. The temperature was increased to reflux and maintained at 70 ℃ for 12 hours. 반응 혼합물을 교반에 의해 주위 온도까지 냉각시키고 여과 분리한다. It cooled to ambient temperature, by stirring the reaction mixture was filtered. 고체를 클로로포름으로 세척한 후 건조한다. The dried After washing the solids with chloroform. 알킬화제 2-클로로에틸-N,N-디메틸아민을 n-부탄올에 용해하고 4-메틸-피리 딘의 당량(18.028g)을 첨가한다. Alkylating agent 2-chloro-ethyl -N, N- dimethylamine dissolved in n- butanol and 4-methyl-added the equivalent weight (18.028g) of flutes Dean. 온도를 120℃까지 승온한 후, 6 시간 동안 120℃로 유지한다. After the temperature was raised to 120 ℃, and kept at 120 ℃ for 6 hours. 그 다음 온도를 70℃까지 낮춘다. Lower the temperature to the next 70 ℃. 디메틸아미노 벤즈알데히드의 당량(30.0 g)과 촉매량(3.6g)의 피페리딘을 제1 반응 단계에서 얻어진 반응 혼합물에 첨가한 다음, 그 반응 혼합물을 70℃에서 24시간 동안 교반한다. Was added piperidine equivalent of dimethylamino benzaldehyde (30.0 g) and a catalytic amount (3.6g) to the reaction mixture obtained in the first reaction step, followed by stirring for 24 hours the reaction mixture at 70 ℃. 100 ml 클로로포름 중의 2,2-디티오디에탄올 15.4g과 피리딘 24.1g의 혼합물을 교반과 동시에 0℃까지 냉각한 다음, 염화토실 41.0 g을 소량씩 첨가하고, 외부 냉각에 의해 온도를 0℃로 유지한다. Cooling the 2,2-dithiol audio ethanol mixture of 15.4g and 24.1g pyridine in 100 ml of chloroform while stirring to 0 ℃ added, in small portions 41.0 g of tosyl chloride, and maintaining the temperature at 0 ℃ by external cooling do. 부가 완료 후, 그 혼합물을 냉장고에서 철야 방치하여 반응을 완결시킨다. After the addition is completed, to complete the reaction and allowed to stand overnight and the mixture in the refrigerator. 이 반응 혼합물을 물/염산 및 얼음 슬러리와 혼합한 후, 상 분리를 한 후 물로 세척한 다음 건조한다. After the reaction mixture is mixed with a water / hydrochloric acid and ice slurry, was washed and then the phase separation with water and dried. 톨루엔술포네이트 디에스테르의 용액을 제4 반응 단계에서 출발 화합물로서 사용한다. And a solution of toluenesulfonate diester as the starting compound in a fourth reaction step. 중간체 염료 분자 2 당량(56g)을 제4 반응 단계에서 얻어진 알킬화제에 용매와 함께 용해한다. It is dissolved with the intermediate dye molecule 2 equivalents (56g) and a solvent in alkylation agent obtained in the fourth reaction step. 온도를 환류까지 상승시키고 12 시간 동안 70℃로 유지한다. The temperature was increased to reflux and maintained at 70 ℃ for 12 hours. 반응 혼합물을 교반에 의해 주위 온도까지 냉각시키고 여과 분리한다. It cooled to ambient temperature, by stirring the reaction mixture was filtered. 고체를 클로로 포름으로 세척한 후 건조한다. The dried After washing the solid with chloro form. 염색된 모발의 세탁견뢰도는 『Industrial organic pigments by Herbs & Hunger, 2nd ed. Wash fastness of dyed hair is "Industrial organic pigments by Herbs & Hunger, 2nd ed. engl. engl. S. 61) Nr 10: DIN 54 001-8-1982, "Herstellung und Bewertung der Aenderung der Farbe", ISO 105-A02-1993』에 따른 그레이 스케일에 의해 분석한다. S. 61) Nr 10: DIN 54 001-8-1982, "Herstellung und Bewertung der Aenderung der Farbe", is analyzed by the Gray scale according to ISO 105-A02-1993. " 아쿠아, 암모늄 티오글리콜레이트, 중탄산 암모늄, 에톡시디글리콜, 헥실렌 글리콜, 티오글리콜산; Aqua, ammonium thioglycolate, ammonium bicarbonate, an ethoxy CD glycol, hexylene glycol, and thioglycolic acid; 티올락트산, PEG-60 수소화된 피마자 오일, 글리신, 에티드론산, 이소세테쓰-20, 폴리실리콘-9, 스티렌/PVP 공중합체, 트리데세쓰-12, 아모디메티콘, 세트리모늄 클로라이드, 수산화 암모늄, 폴리쿼터늄-6, 이소프로필 알코올, 알코올 데나트, 시메티콘, 향수. The thiol acid, PEG-60 hydrogenated castor oil, glycine, the lactide acid, isophthalic three Nishitetsu -20, polysilicon-9, Styrene / PVP copolymer, tri sesseu to -12, Oh-modify methicone, set remote chloride, ammonium hydroxide, polyquaternium-6, isopropyl alcohol, alcohol Gardena agent, simethicone, perfume. 기본 재료: 아쿠아, 과산화수소, 프로필렌 글리콜, 라우릴디모늄 히드록시프로필 가수분해된 밀 단백질, PEG-5 코카미드, 나트륨 코코암포아세테이트, 폴리쿼터늄-35, 코코-베타인, 아세트아미노펜, 인산, 염화나트륨, 향수. Basic material: Water, hydrogen peroxide, propylene glycol, lauryl dimonium hydroxypropyl hydrolyzed wheat protein, PEG-5 cocamide, sodium coco ampo acetate, polyquaternium -35, coco-beta, Acetaminophen, Phosphoric Acid, sodium chloride, perfume. 용액 3 (염색액) : 염료 0.1%를 비이온성 계면활성제(Plantacare 200UP, 헹켈 제조)의 10% 용액에 용해시키고, 구연산 또는 모노에탄올아민을 사용하여 pH 9.5로 조정한다. Solution 3 (dyeing solution): was dissolved in a 10% solution of the dye 0.1% non-ionic surfactant (Plantacare 200UP, Canada only, Ltd.), using citric acid or monoethanolamine is adjusted to pH 9.5. 실시예 AX에 따른 화학식(ELV 1703)의 화합물 50 mg을 메탄올 10g에 용해시킨 다음, 40g의 플란타렌 용액(10 수용액, Ph=9.5)을 첨가한다. Example AX was dissolved 50 mg of the compound of formula (ELV 1703) according to the 10g of methanol, followed by addition of alkylene Planta solution (10 solution, Ph = 9.5) of 40g. 이 적색-염색 용액을 실온에서 건조 모발(2개의 블론드, 2개의 중간 정도 블론드, 2개의 브라운과 2개의 손상된 모발 스트랜드) 상에 도포하고 또 실온에서 20분간 방치한다. The red-coated on the dried dye solution at room temperature, the hair (two blond, two middle of blond, two brown and two damaged hair strands) and allowed to stand again at room temperature for 20 minutes. 이어, 스트랜드를 수도물(물 온도: 37℃ +/- 1℃; 물의 유속: 5-6 리터/분)로 린스하고 실온에서 12 시간 동안 건조한다. Then, a strand of tap water:;: is rinsed with (water temperature of 5-6 l / min 37 ℃ +/- 1 ℃ flow rate of water) and dried for 12 hours at room temperature. 세척 견뢰도: 샴푸로 10회 세척. Washing fastness: 10 three times with shampoo. 0.1% 암모늄트오글리콜레이트 용액(암모니아와 구연산에 의해 pH를 8로 조절)을 실온에서 샴푸한 모발(2개의 블론드, 2개의 중간 정도 블론드, 2개의 브라운과 2개의 손상된 모발 스트랜드) 상에 도포하고 10분간 방치한다. And applied on a 0.1% ammonium teuoh glycolate solution (adjusted to pH 8 by an ammonia and citric acid) to the hair (two blond, two middle of blond, two brown and two damaged hair strands) shampoo at room temperature and allow to stand for 10 minutes. 이어, 스트랜드를 수도물(물 온도: 37℃ +/- 1℃; 물의 유속: 5-6 리터/분)로 린스하고, 수건으로 건조한 스트랜드를 적용 실시예 B1의 0.1 중량%의 착색 물질 용액으로 처리한 후, 20분 동안 방치한 다음, 수도물(물 온도: 37℃ +/- 1℃; 물의 유속: 5-6 리터/분)로 린스한다. Next, tap water, a strand (water temperature: 37 ℃ +/- 1 ℃; flow rate of water: 5-6 l / min.) To rinse and towel dry strands applied in practice treated as a coloring material solution of 0.1 wt% of Example B1 and rinsed with:;: (5-6 l / min flow rate of water 37 ℃ +/- 1 ℃ water temperature) was allowed to stand for a while after, 20 minutes, and then tap water. 그 다음, 수건으로 건조한 스트랜드를 용액 2(퍼머 고정액)으로 처리한 후 10 분 동안 방치한다. Next, after processing the dried strands with a towel into the solution 2 (permanent fixing solution) it was allowed to stand for 10 minutes. 그 다음, 스트랜드를 수도물(물 온도: 37℃ +/- 1℃; 물의 유속: 5-6 리터/분)로 린스한 후, 실온에서 12 시간 건조한다. Then, a strand of tap water:;: is rinsed with (water temperature of 5-6 l / min 37 ℃ +/- 1 ℃ flow rate of water), dried at room temperature for 12 hours. 용액 1(퍼머 로숀)을 실온에서 샴푸한 모발(2개의 블론드, 2개의 중간 정도 블론드, 2개의 브라운과 2개의 손상된 모발 스트랜드) 상에 도포하고 10분간 방치한다. Solution was applied on a 1 (permanent lotion) for the hair (two blond, two middle of blond, two brown and two damaged hair strands) at room temperature for shampoo and allowed to stand for 10 minutes. 이어, 스트랜드를 수도물(물 온도: 37℃ +/- 1℃; 물의 유속: 5-6 리터/분)로 린스하고, 수건으로 건조한 스트랜드를 적용 실시예 B1의 0.1 중량%의 착색 물질 용액으로 처리한 후, 20분 동안 방치한 다음, 수도물(물 온도: 37℃ +/- 1℃; 물의 유속: 5-6 리터/분)로 린스한다. Next, tap water, a strand (water temperature: 37 ℃ +/- 1 ℃; flow rate of water: 5-6 l / min.) To rinse and towel dry strands applied in practice treated as a coloring material solution of 0.1 wt% of Example B1 and rinsed with:;: (5-6 l / min flow rate of water 37 ℃ +/- 1 ℃ water temperature) was allowed to stand for a while after, 20 minutes, and then tap water. 그 다음, 수건으로 건조한 스트랜드를 실온에서 용액 2(퍼머 고정액)으로 처리한 후 10 분 동안 방치한다. Next, after the treatment at room temperature with a towel dry strands in solution 2 (permanent fixing solution) it was allowed to stand for 10 minutes. 그 다음, 스트랜드를 수도물(물 온도: 37℃ +/- 1℃; 물의 유속: 5-6 리터/분)로 린스한 후, 실온에서 12 시간 건조한다. Then, a strand of tap water:;: is rinsed with (water temperature of 5-6 l / min 37 ℃ +/- 1 ℃ flow rate of water), dried at room temperature for 12 hours. 화학식(104)의 화합물 50 mg을 메탄올 10g에 용해시킨 다음, 40g의 물을 첨가한다: 이 황색-염색 용액을 실온에서 건조 모발(2개의 블론드, 2개의 중간 정도 블론드 및 2개의 손상된 모발 스트랜드) 상에 도포하고, 또 실온에서 20분간 방치한다. Formula 104 compounds were dissolved in 50 mg of methanol, 10g, and then, the was added to the 40g water: This yellow dyeing solution to dry hair at room temperature (two blond, two middle of blond, and two damaged hair strands) applied to the surface of, and again allowed to stand at room temperature for 20 minutes. 이어, 스트랜드를 수도물(물 온도: 37℃ +/- 1℃; 물의 유속: 5-6 리터/분)로 린스하고 12 시간 동안 건조한다. Then, a strand of tap water:;: is rinsed with (water temperature of 5-6 l / min 37 ℃ +/- 1 ℃ flow rate of water) and dried for 12 hours. 용액 1(퍼머 로숀)을 실온에서 샴푸한 모발(2개의 블론드, 2개의 중간 정도 블론드 및 2개의 손상된 모발 스트랜드) 상에 도포하고 10분간 방치한다. Solution was applied on a 1 (permanent lotion) for the hair (two blond, two middle blond, and two damaged hair strands degree) shampoo at room temperature and allowed to stand for 10 minutes. 이어, 스 트랜드를 수도물(물 온도: 37℃ +/- 1℃; 물의 유속: 5-6 리터/분)로 린스하고, 수건으로 건조한 스트랜드를 적용 실시예 B4의 0.1 중량%의 착색 물질 용액으로 처리한 후, 20분 동안 방치한 다음, 수도물(물 온도: 37℃ +/- 1℃; 물의 유속: 5-6 리터/분)로 린스한다. Then, the tap water's trend:;: a coloring material solution of 0.1% by weight of Example B4 applying the dry strands in the rinse, and towel (water temperature of 5-6 l / min 37 ℃ +/- 1 ℃ water flow rate) was allowed to stand for a post-treated for 20 minutes, and then tap water:;: is rinsed with (water temperature of 5-6 l / min flow rate of water 37 ℃ +/- 1 ℃). 그 다음, 수건으로 건조한 스트랜드를 실온에서 용액 2(퍼머 고정액)으로 처리한 후 10 분 동안 방치한다. Next, after the treatment at room temperature with a towel dry strands in solution 2 (permanent fixing solution) it was allowed to stand for 10 minutes. 그 다음, 스트랜드를 수도물(물 온도: 37℃ +/- 1℃; 물의 유속: 5-6 리터/분)로 린스한 후, 실온에서 12 시간 건조한다. Then, a strand of tap water:;: is rinsed with (water temperature of 5-6 l / min 37 ℃ +/- 1 ℃ flow rate of water), dried at room temperature for 12 hours. 본 발명의 염료는 세탁, 광, 샴푸 및 문지름에 대하여 양호한 견뢰도 특성을 갖는 깊이 염색되는 특징이 있다. Dyes of the present invention is characterized in that deep dyeing having good fastness properties with respect to washing, light, rubbing and shampoo. 제 1항에 있어서, Y 1 및 Y 2 가 C 1 -C 10 알킬렌; The method of claim 1 wherein, Y 1 and Y 2 is C 1 -C 10 alkylene; 또는 C 5 -C 10 시클로알킬렌인 방법. Or C 5 -C 10 cycloalkylene manner. 제 1항 또는 제 2항에 있어서, Y 1 및 Y 2 가 C 1 -C 5 알킬렌인 방법. According to claim 1 or 2 wherein, Y 1 and Y 2 method is a C 1 -C 5 alkylene. 제 1항 내지 제 3항 중 어느 하나에 있어서, R 1 , R' 1 , R 2 , R' 2 , R 3 및 R' 3 가 서로 독립적으로 수소; Any one of claims 1 to A method according to any one of the 3, R 1, R '1, R 2, R' 2, R 3 and R '3 are independently from each other hydrogen; C 1 -C 5 알킬; C 1 -C 5 alkyl; NO 2 ; NO 2; 또는 화학식(1a) -NR 4 R 5 의 라디칼 (여기서 R 4 및 R 5 는 서로 독립적으로 수소임); Or the general formula (1a) the radical -NR 4 R 5 (wherein R 4 and R 5 are each hydrogen may independently); 또는 C 1 -C 5 알킬인 방법. Or C 1 -C 5 alkyl manner. 제 4항에 있어서, R 1 , R' 1 , R 2 , R' 2 , R 3 및 R' 3 가 서로 독립적으로 수소; The method of claim 4, wherein, R 1, R '1, R 2, R' 2, R 3 and R '3 are independently from each other hydrogen; C 1 -C 5 알킬; C 1 -C 5 alkyl; NO 2 ; NO 2; 또는 NH 2 인 방법. Or NH 2 method. 제 1항에 있어서, R 1 , R' 1 , R 2 , R' 2 , R 3 및 R' 3 가 수소인 방법. The method of claim 1, wherein, R 1, R '1, R 2, R' 2, R 3 and R 'Method 3 is hydrogen. 제 1항에 있어서, Q 및 Q'가 직접 결합 또는 -(R 6 )NC(O)-이고, 여기서 R 6 가 수소 또는 C 1 -C 5 알킬인 방법. According to claim 1, Q and Q 'is a direct bond or - (R 6) NC (O ) - , in which R 6 is a 5-way alkyl hydrogen or C 1 -C.
R 1 , R' 1 , R 2 , R' 2 , R 3 , R' 3 , Q, Q', Y 및 Y'는 제 1항에서 정의한 바와 같다. R 1, R '1, R 2, R' 2, R 3, R '3, Q, Q', Y and Y 'are as defined in claim 1. 제 1항 내지 제 11항 중 어느 하나에 있어서, 염색이 환원제의 존재 하에서 실시되는 방법. The method according to any one of to claim 11, wherein the dyeing is carried out in the presence of a reducing agent. 제 12항에 있어서, 환원제가 티오글리콜 산 또는 그의 염, 글리세린 모노티오글리콜레이트, 시스테인, 2-머캅토프로피온산, 2-머캅토에틸아민, 티오락트산, 티오글리세린, 아황산나트륨, 디티오나이트, 아황산 암모늄, 중아황산 나트륨, 메타중아황산 나트륨 및 히드로퀴논으로부터 선택되는 방법. 13. The method of claim 12, wherein the reducing agent is thioglycolic acid or its salts, glycerine mono thioglycolate, cysteine, 2-mercaptopropionic acid, 2-mercaptoethyl amine, thio acid, thio glycerol, sodium sulphite, dithionite, sulfite It is selected from ammonium, sodium bisulfite, meta of sodium sulfite and hydroquinone. 로 처리하는 것을 포함하는 방법. Which comprises treatment with. c) 환원제를 함유하는 수계 착색물질 제거 조성물과 상기 모발을 접촉시킴으로써 단계 a)에서 도포된 착색물질을 모발로부터 제거하는 단계. c) removing the coloring matter is applied in step a) by removing water-based coloring material containing a reducing agent, contacting the composition with the hair from the hair. 샴푸, 컨디셔너, 겔 또는 에멀젼의 형태인 제 15항에 따른 조성물. The composition according to the shampoo, conditioner, gel or in claim 15 in the form of an emulsion. 제 16항 또는 제 17항에 있어서, 제 1항에서 정의한 화학식(1)의 적어도 하나의 단일 염료, 및 직접 염료 및/또는 반응성 염료를 포함하는 조성물. Claim 16 or claim 17 wherein at least one single dye of formula (1) defined in claim 1, and compositions comprising the direct dyes and / or dyes. R 6 및 R 6 and R 7 은 서로 독립적으로 수소; R 7 are each independently of the others hydrogen; C 1 -C 14 알킬; C 1 -C 14 alkyl; C 2 -C 14 알케닐; C 2 -C 14 alkenyl; C 6 -C 12 아릴; C 6 -C 12 aryl; C 6 - C 12 아릴-C 1 -C 10 알킬; C 6 - C 12 aryl -C 1 -C 10 alkyl; 또는 C 1 -C 10 알킬(C 5 -C 12 아릴)이다. Or a C 1 -C 10 alkyl (C 5 -C 12 aryl). FR2918667A1 (en) * 2007-07-09 2009-01-16 Oreal Process for staining with a compound of imine type or styryl disulfide / thiol and stimuli, composition and device for implementation of the PROCESS. FR2919179B1 (en) 2007-07-24 2010-02-19 Oreal hair composition comprising at least one disulfide direct dye and at least one alkali hydroxide and shaping the method and simultaneous coloring. FR2920778B1 (en) 2007-09-11 2009-10-30 Oreal Azo compounds quinoliniums a disulfide motif / thiol compositions comprising keratin fiber dyeing process and device. ES2217131T3 (en) 2004-11-01 A method of coloring hair using catonicos dyes.